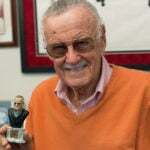 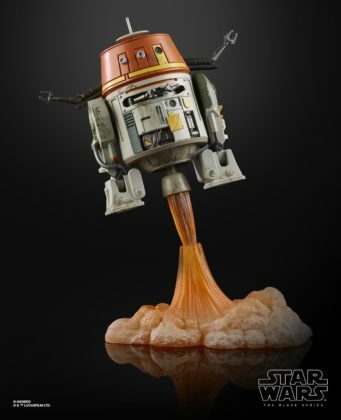 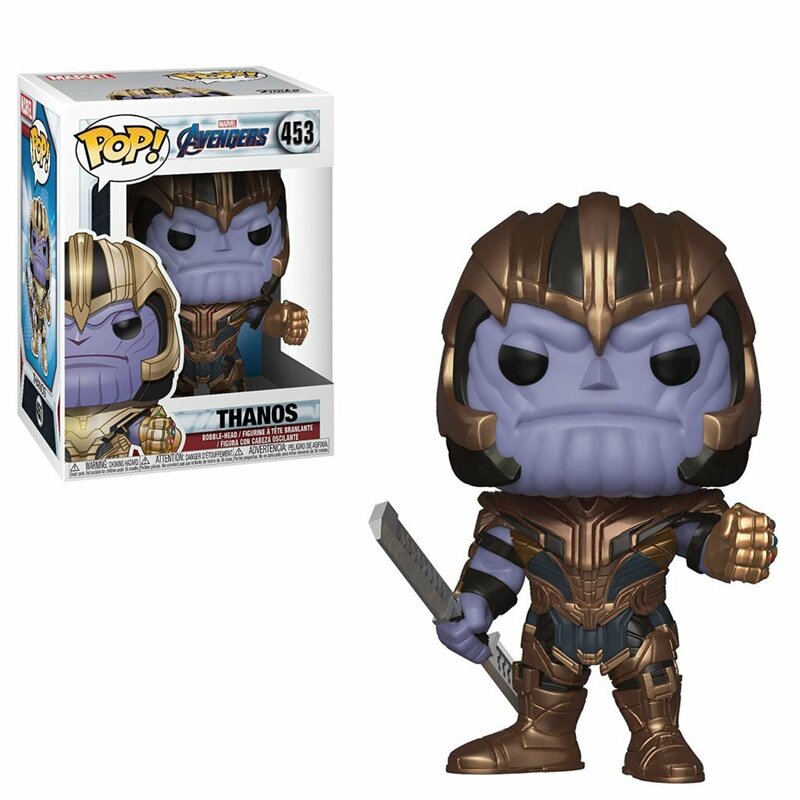 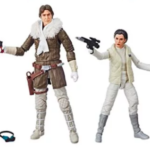 Star Wars toy collectors have an awful lot to look forward to in the coming years, as the popular Lucasfilm licensee Hasbro announced a large selection of new action figures and other accessories from A Galaxy Far, Far Away during their panel on Friday at Star Wars Celebration 2019 in Chicago. At the opening of the presentation, the Hasbro team entered the Twin Suns stage wielding the company’s high-quality lightsabers, and handed them out to enthusiastic fans in the audience, mostly smaller children. 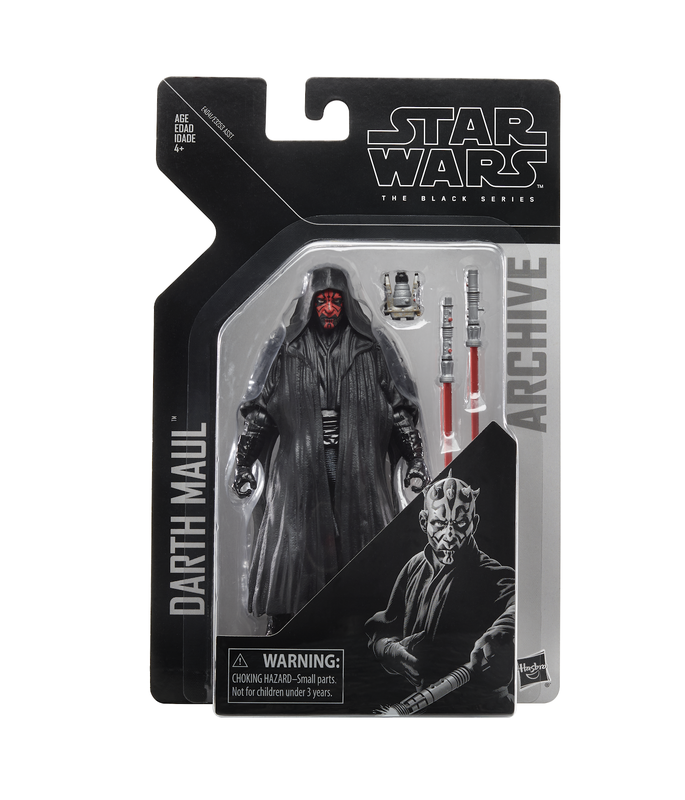 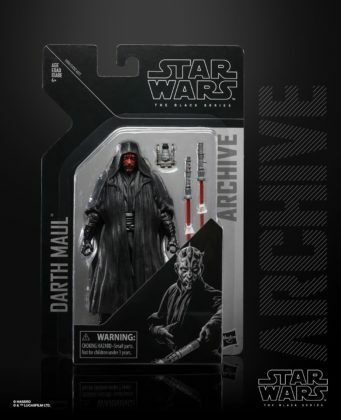 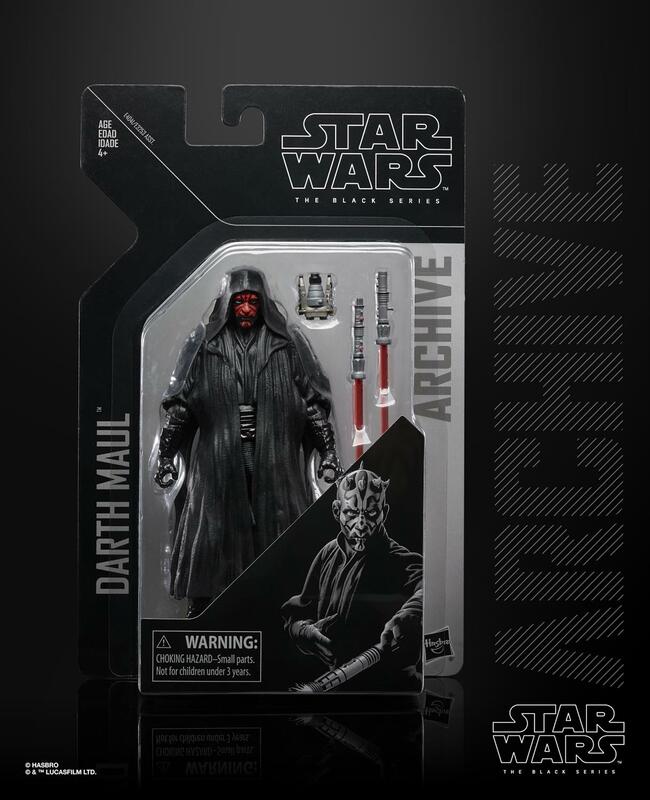 The panel began with a review of Hasbro’s Star Wars Celebration exclusives: the Black Series Obi-Wan Kenobi and Darth Maul on throwback Star Wars: Episode I card backs. 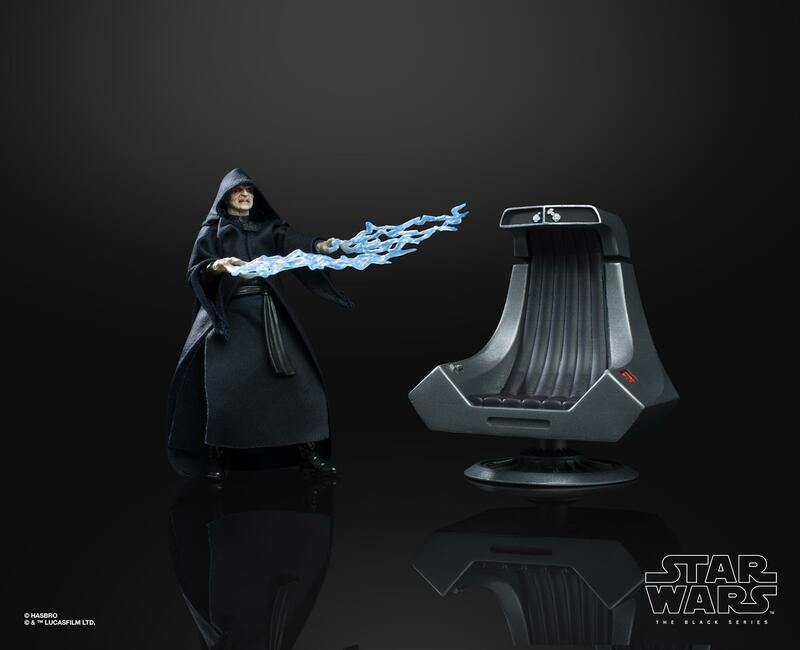 We then learned a little bit about the upcoming Lightsaber Academy interactive weapon. 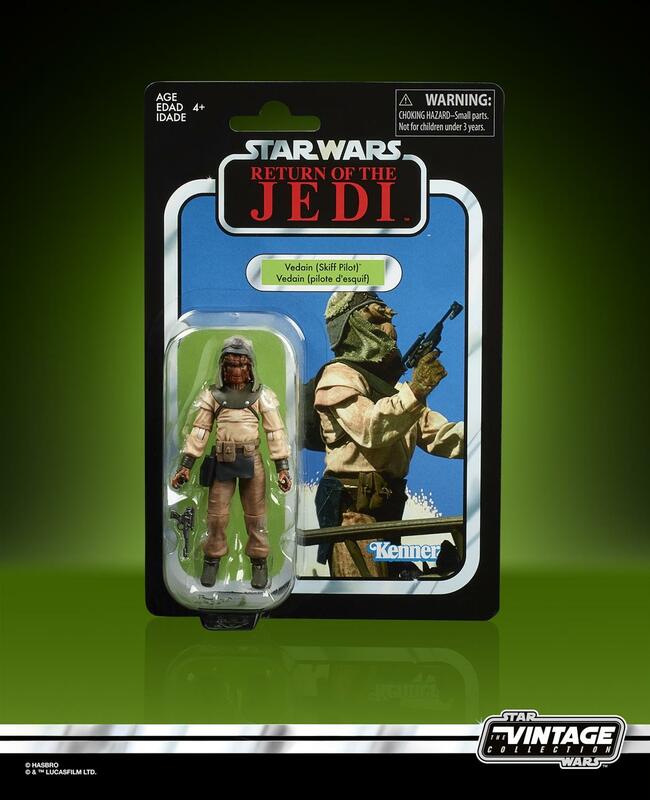 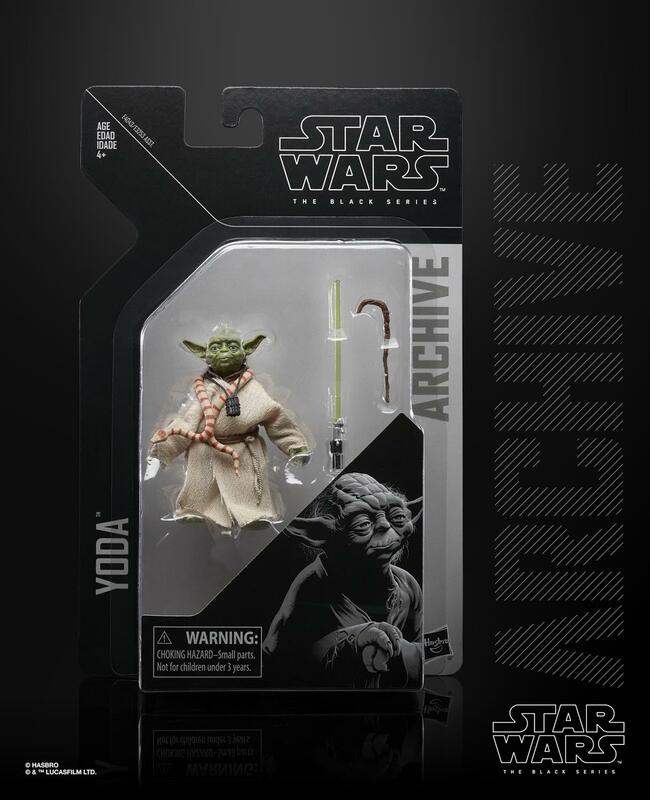 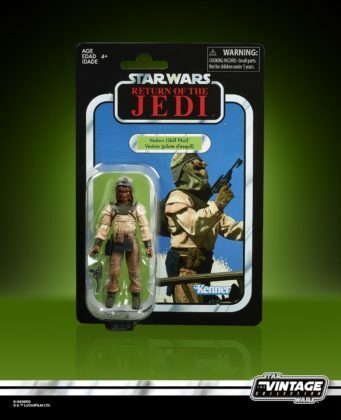 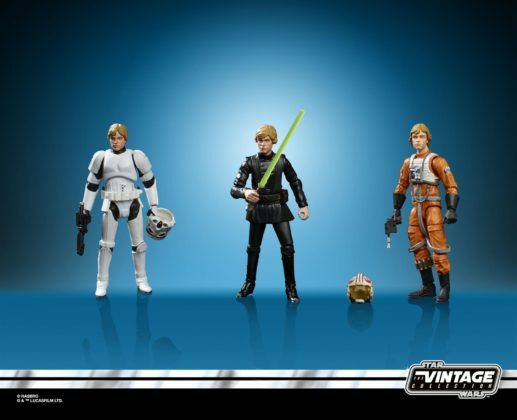 The Hasbro team revealed the results of a fan poll for the next Black Series action figure to come from The Empire Strikes Back, and the winner was Luke Skywalker in Dagobah fatigues, which they said is already in the design stages. 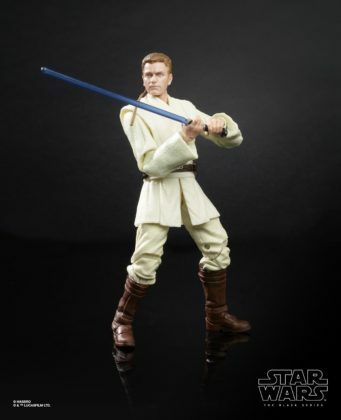 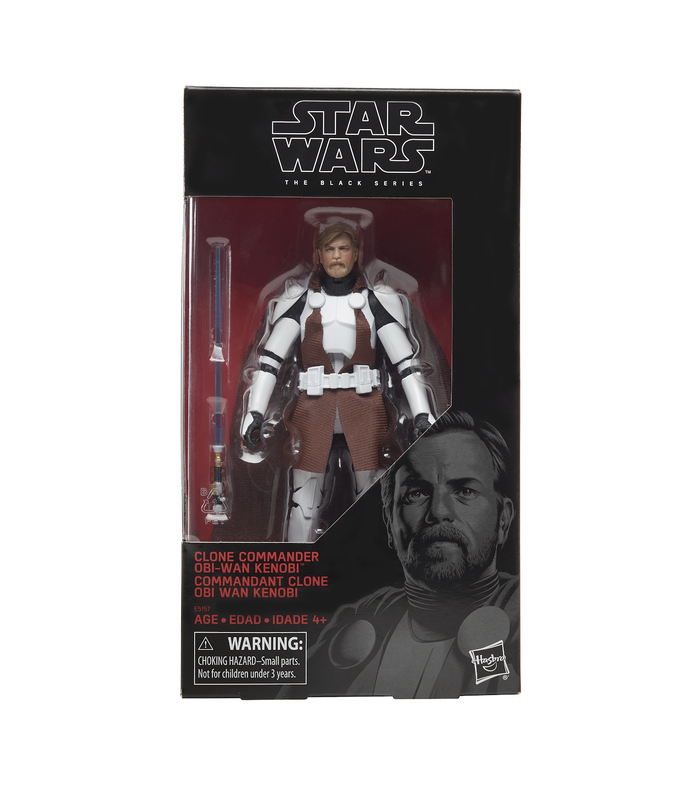 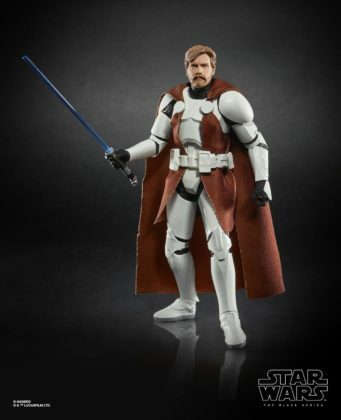 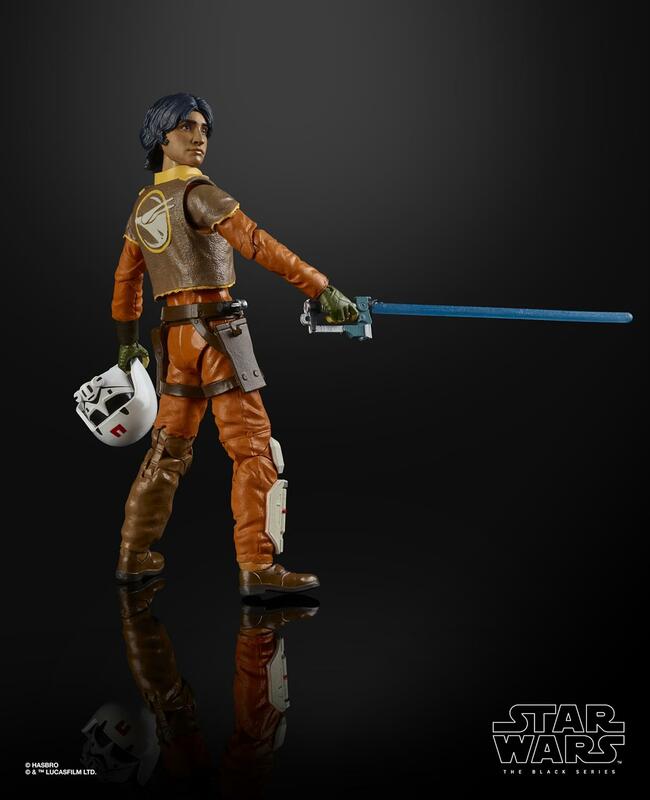 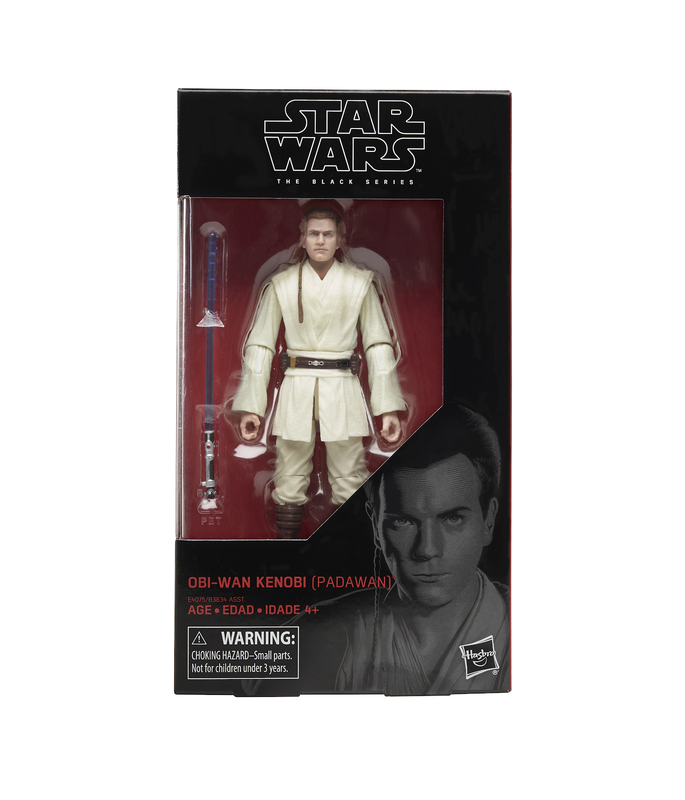 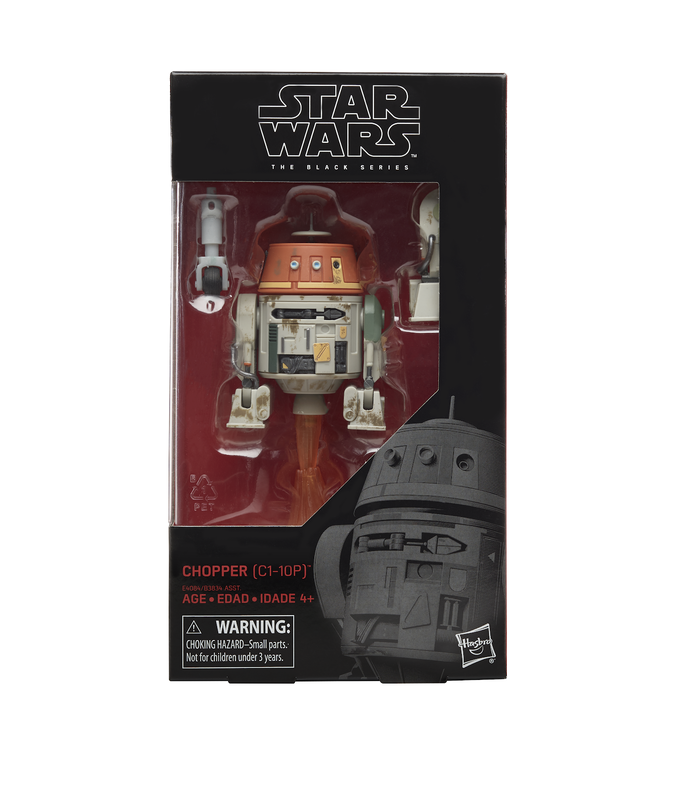 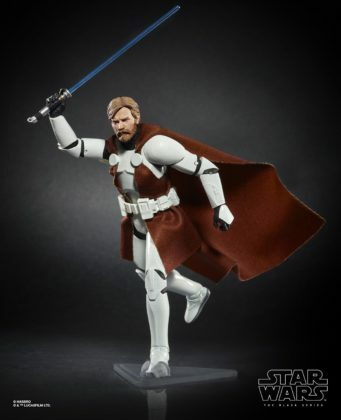 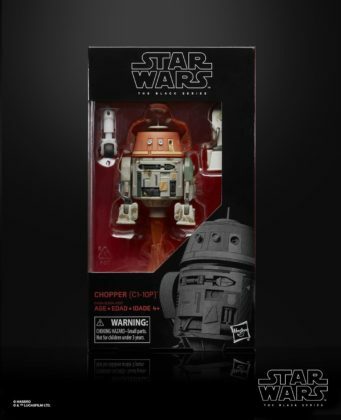 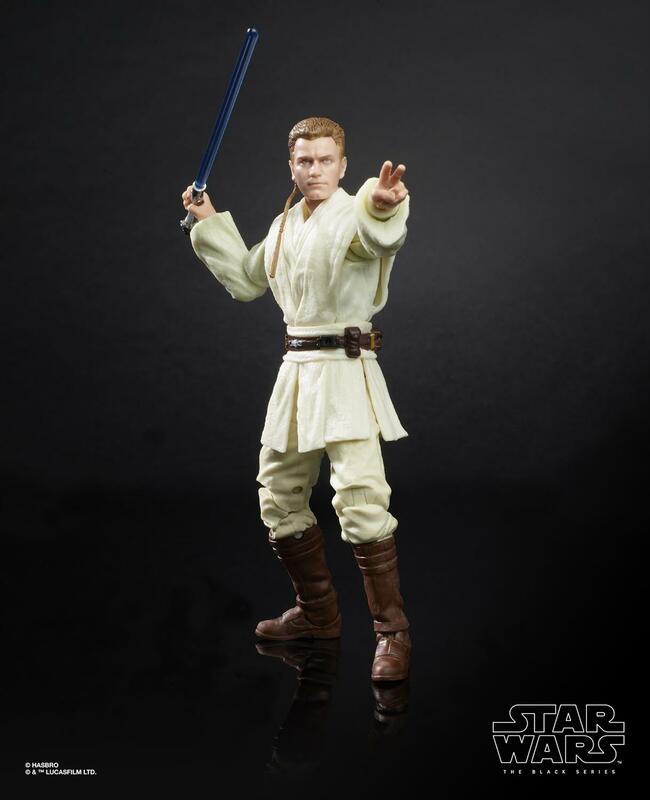 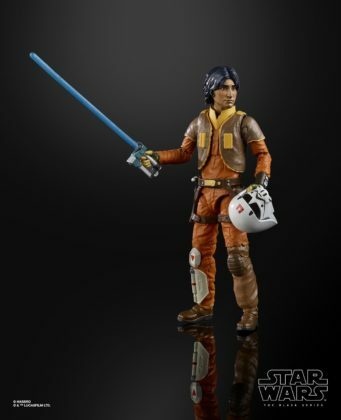 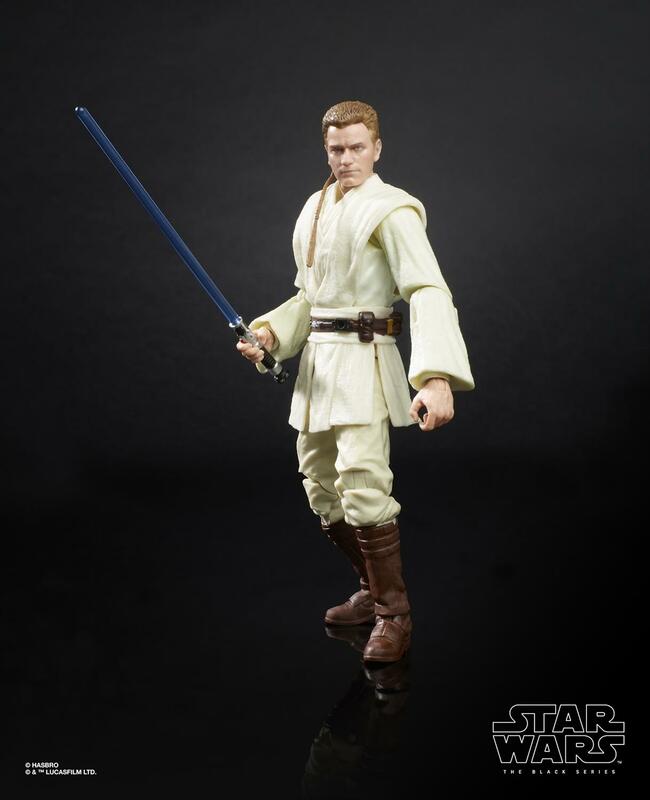 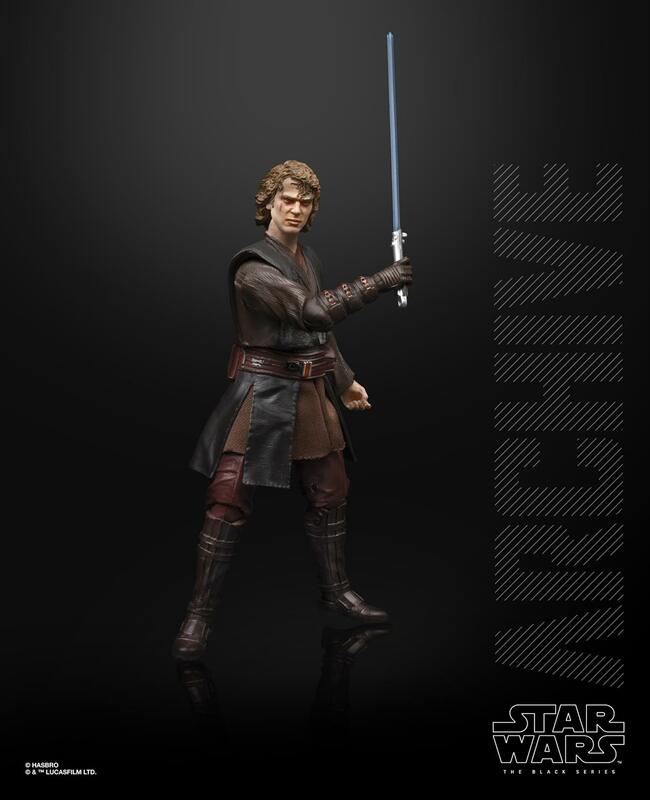 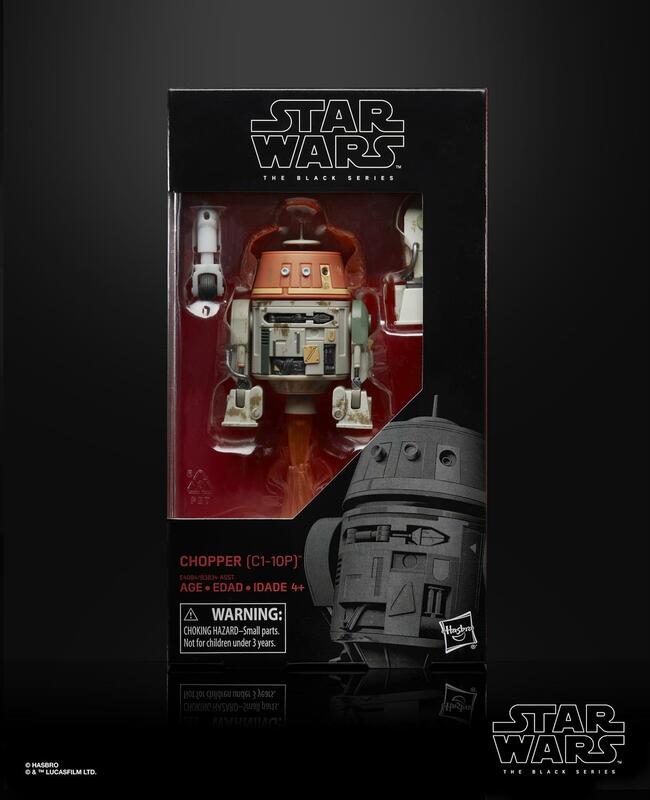 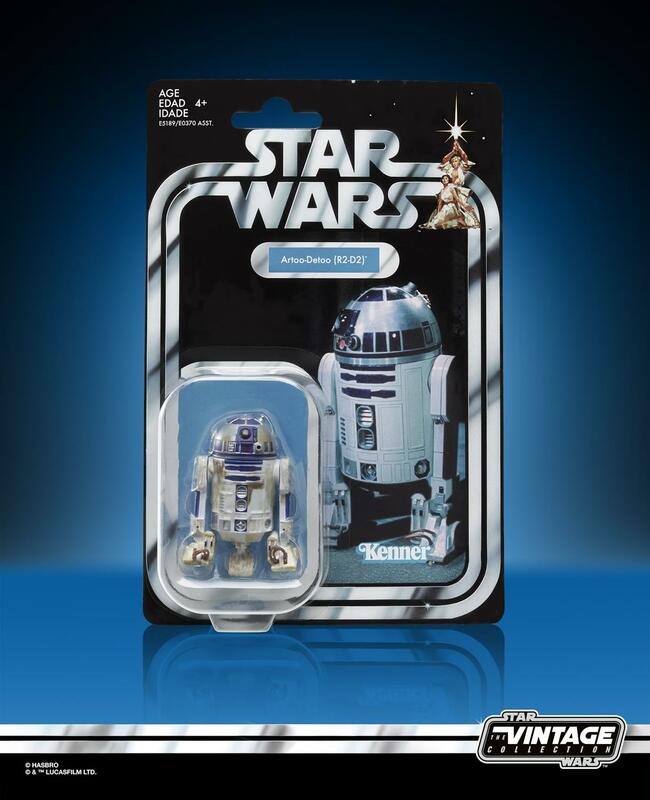 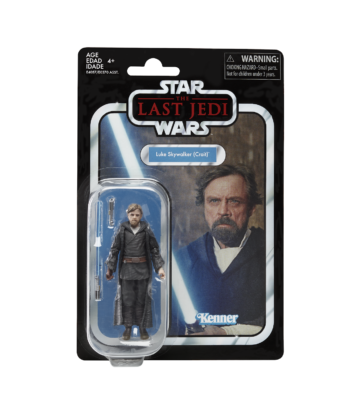 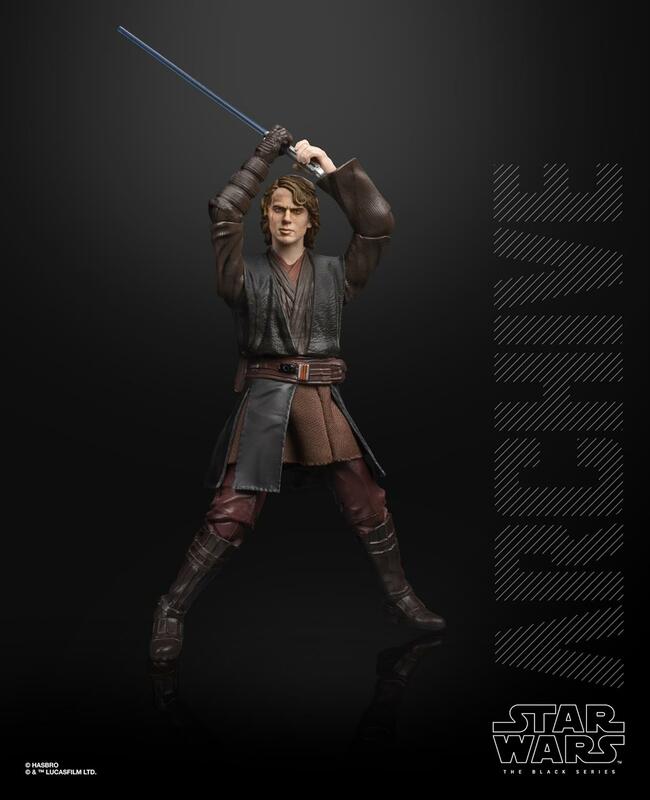 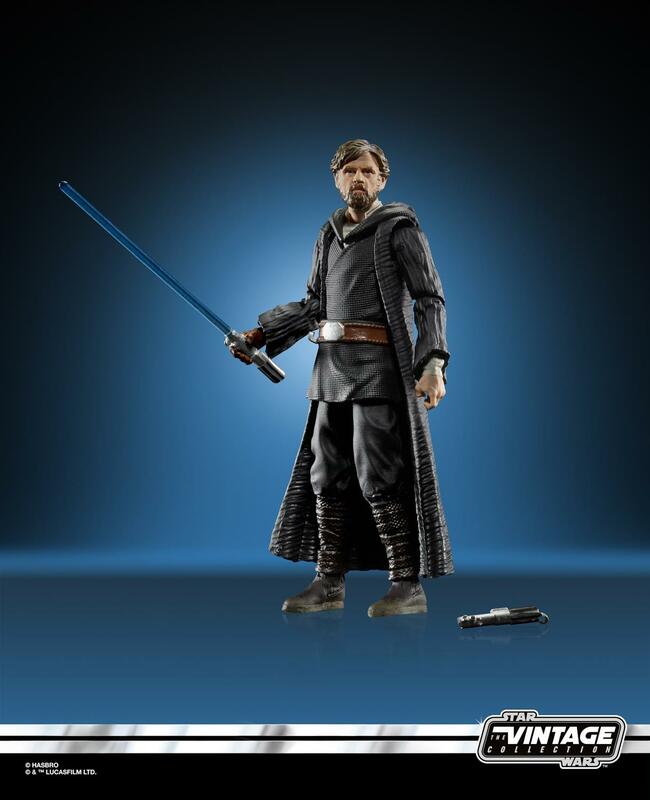 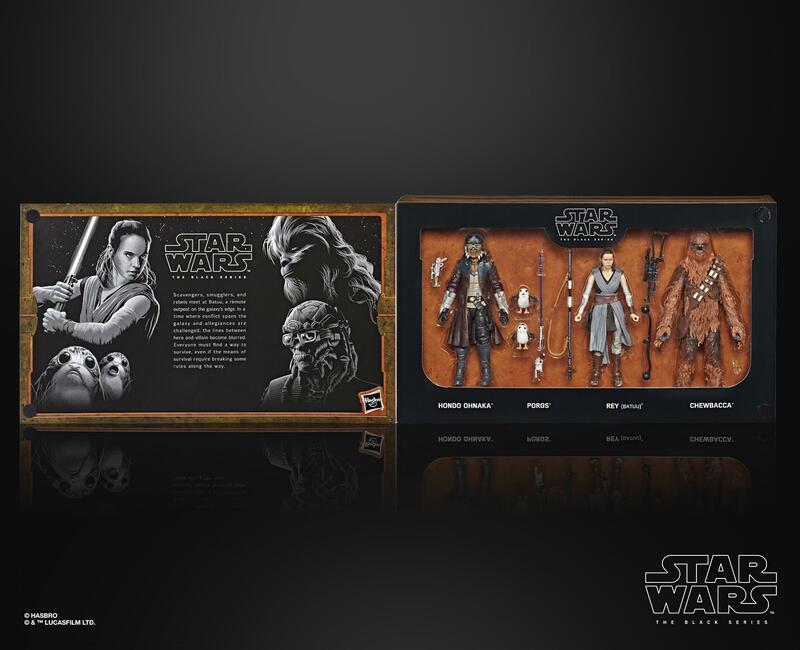 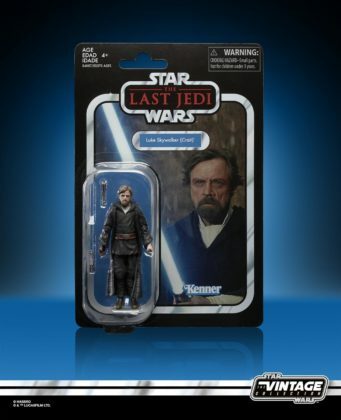 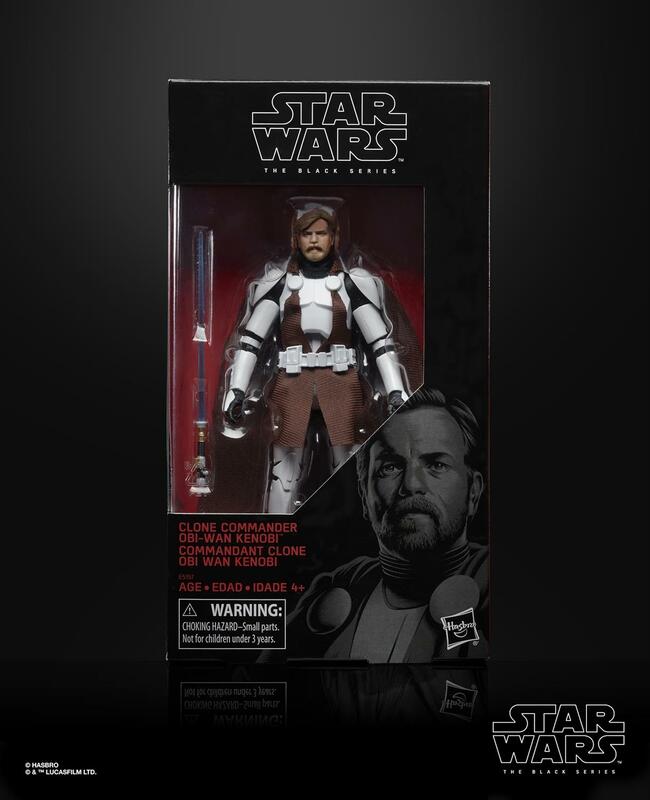 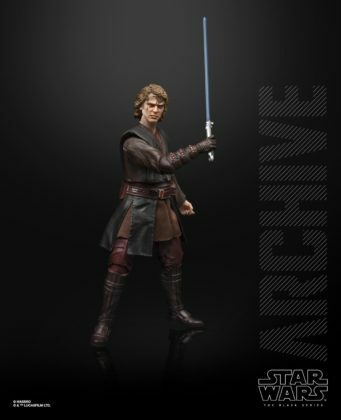 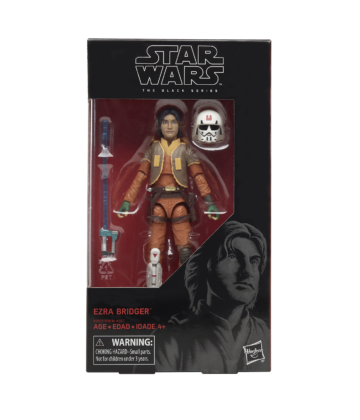 The summer wave of Black Series figures includes young Obi-Wan, Chopper from Star Wars Rebels, plus his pal Ezra Bridger, and the packaging for these new toys was revealed on the screen above the panel. 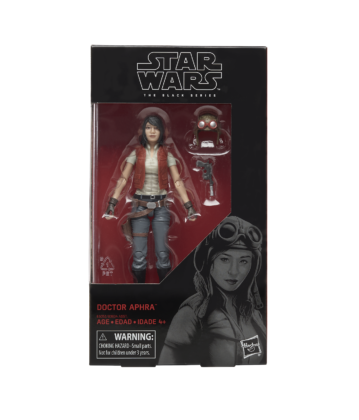 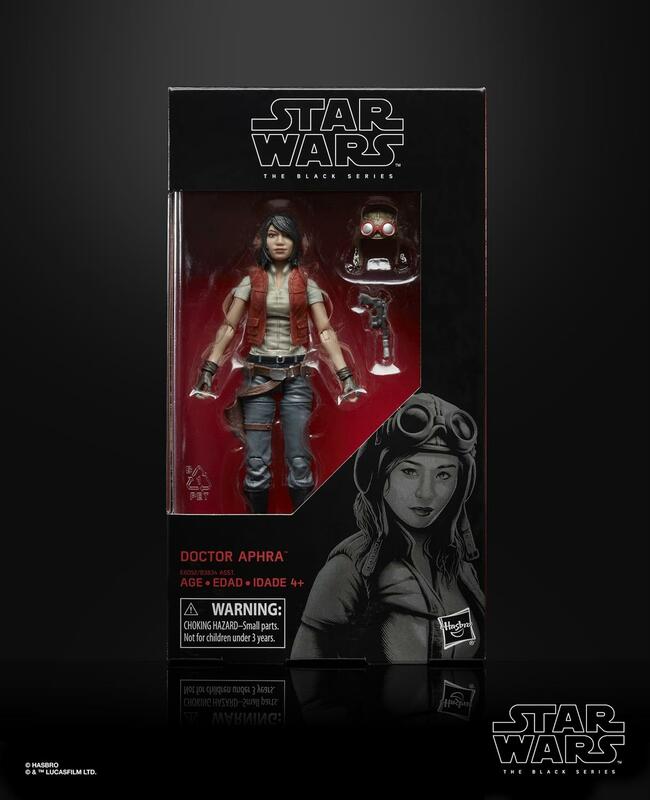 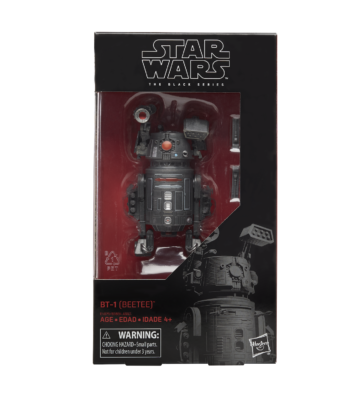 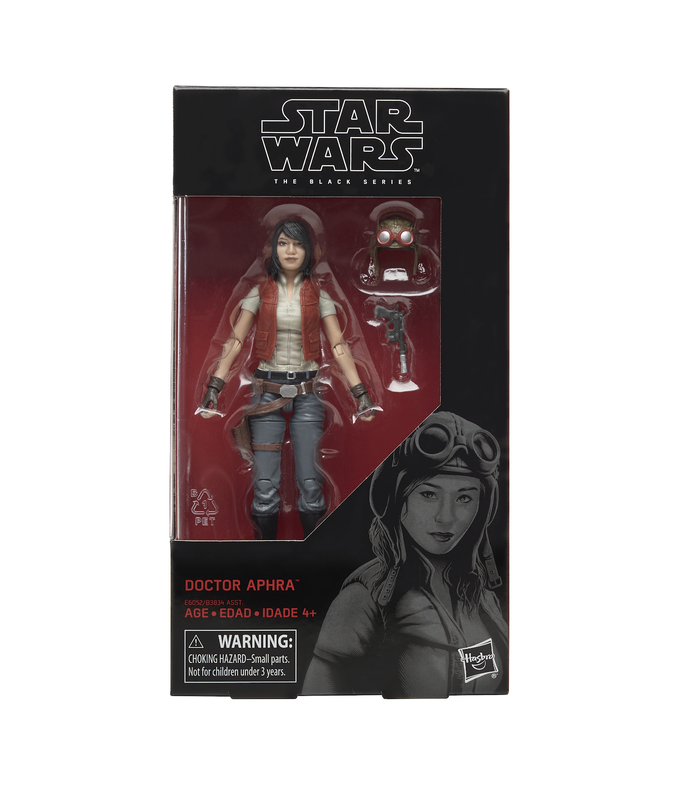 Doctor Aphra and the evil droids BT-1 and Triple Zero from the terrific recent Marvel Comics are making their way to the six-inch Black Series line as well. 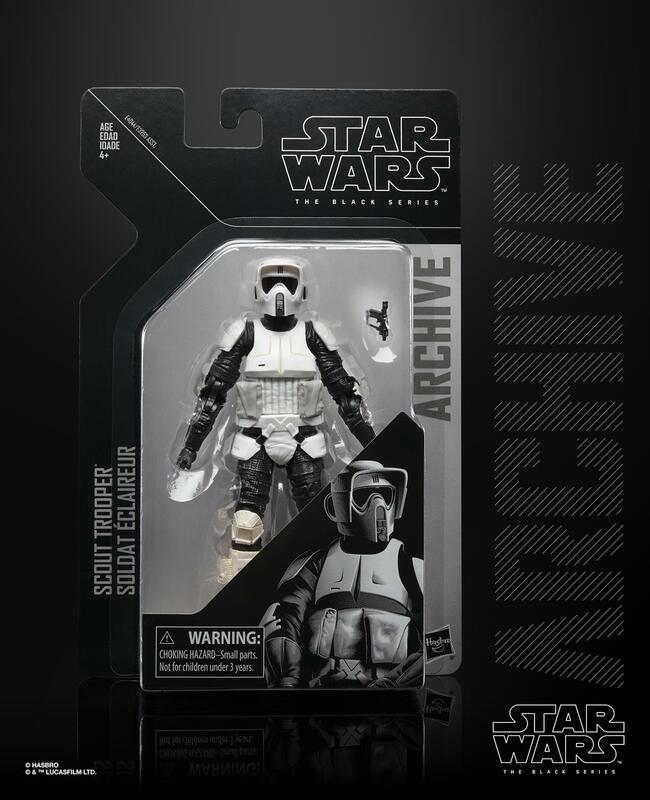 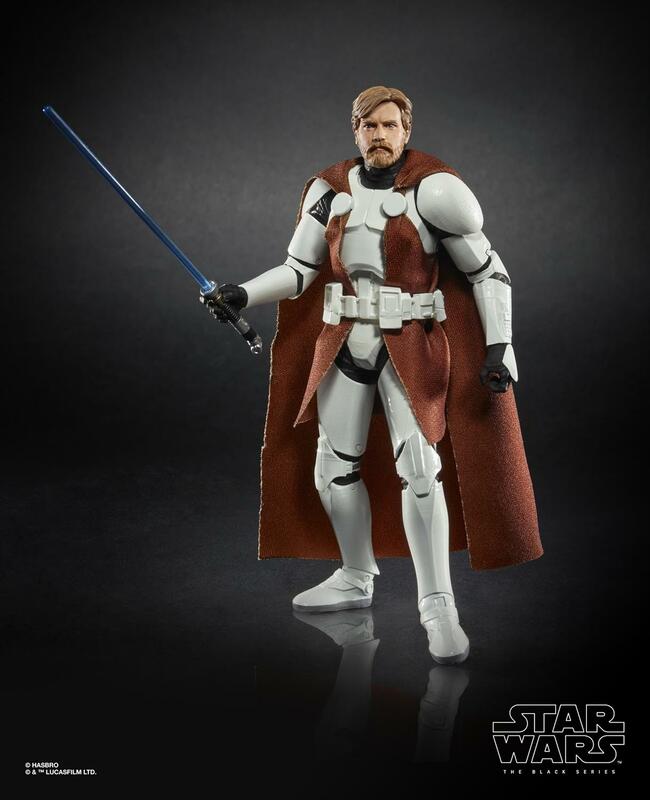 Clone Commander Obi-Wan Kenobi and Black Series Archive figures of the Scout Trooper, Darth Maul, and Anakin Skywalker were also revealed. 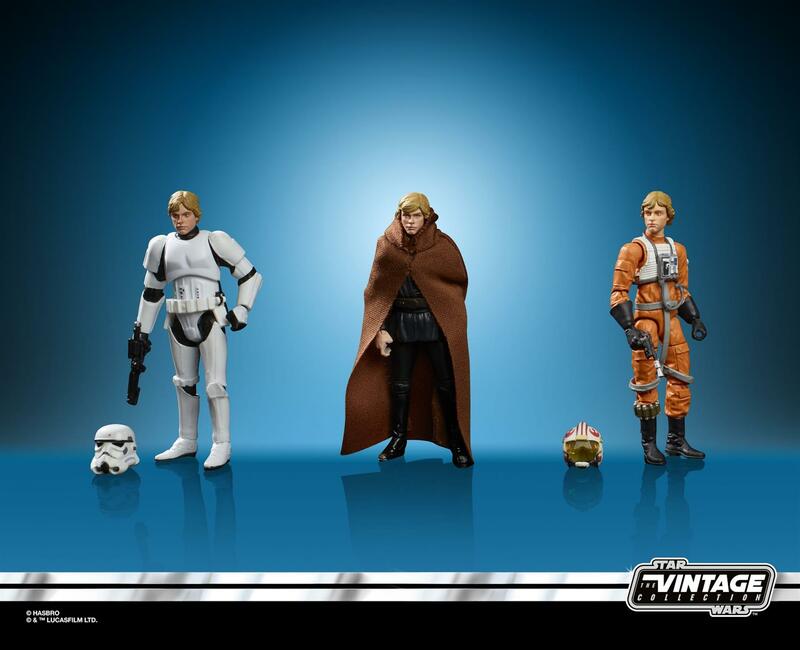 Vintage Collection figures for Luke Skywalker’s Force Projection on Crait from Star Wars: The Last Jedi, the Death Star Gunner, an Imperial Hover Tank Commander, and R2-D2 were then announced. 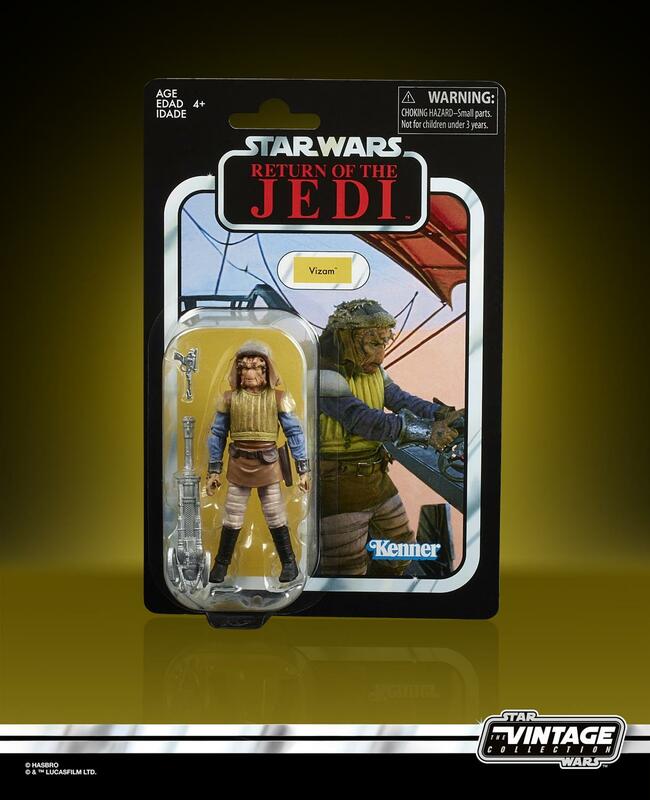 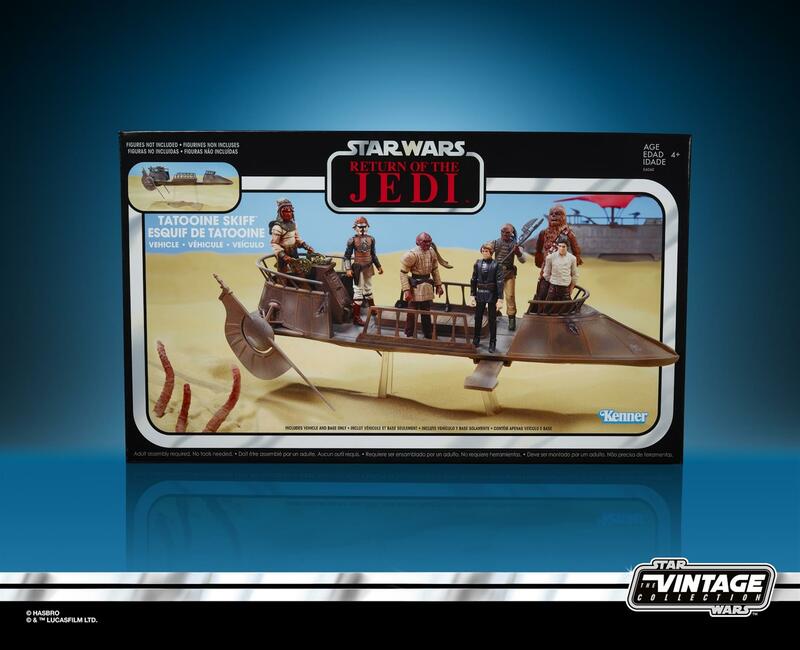 The team reviewed the tremendous Jabba’s Sail Barge playset that recently shipped to dedicated fans, and revealed the packaging for a three-pack of Skiff guard figures that would look great standing on the deck of the Khetanna. 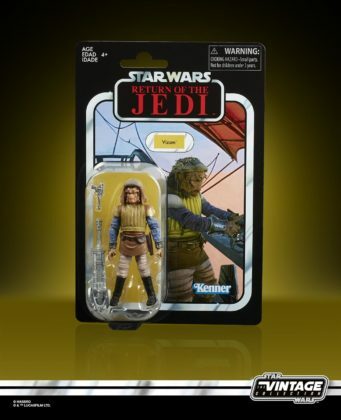 To go along with Jabba’s Sail Barge, Hasbro is releasing a new Tatooine Skiff vehicle in the same scale, and we got a look at the toy’s packaging during the presentation. 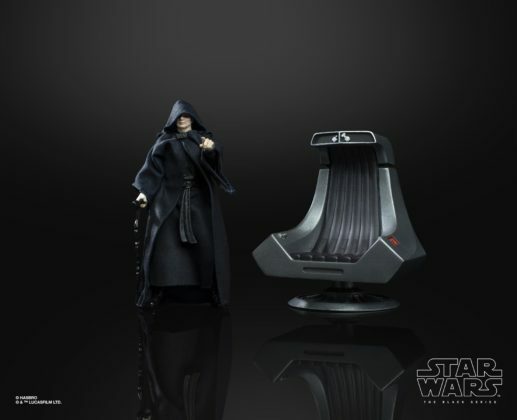 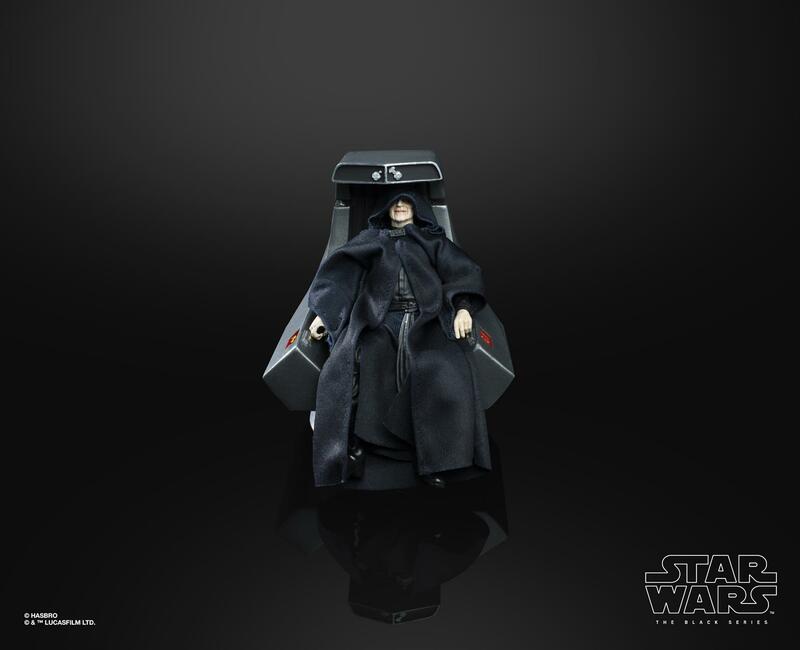 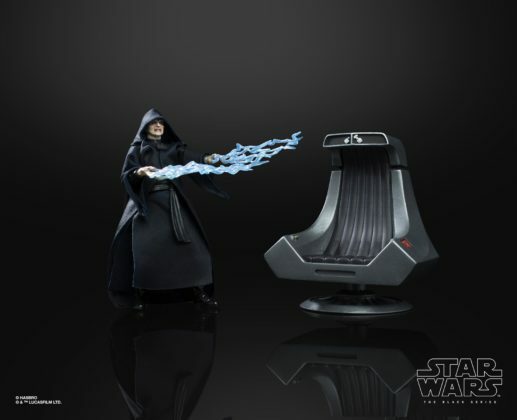 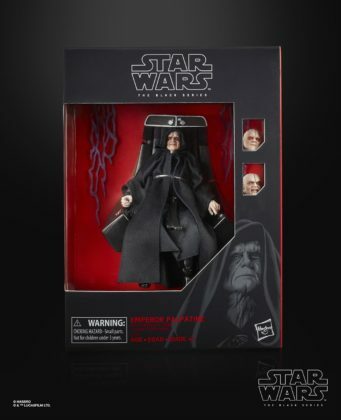 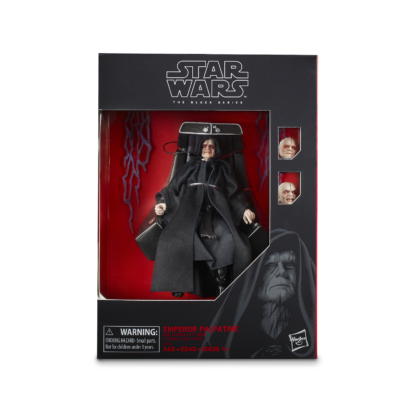 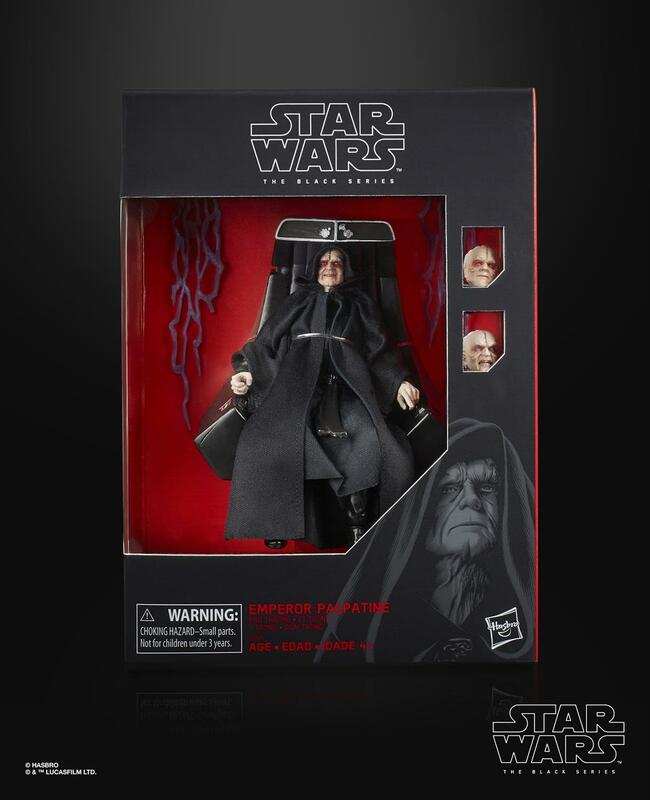 In keeping with the weekend’s theme of the apparent resurrection of Emperor Palpatine, the character is getting a new six-inch Black Series figure with Force Lightning accessories and a cool throne replica from Return of the Jedi. 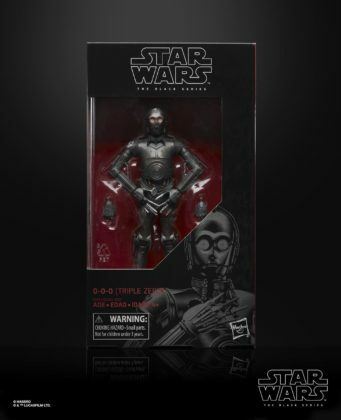 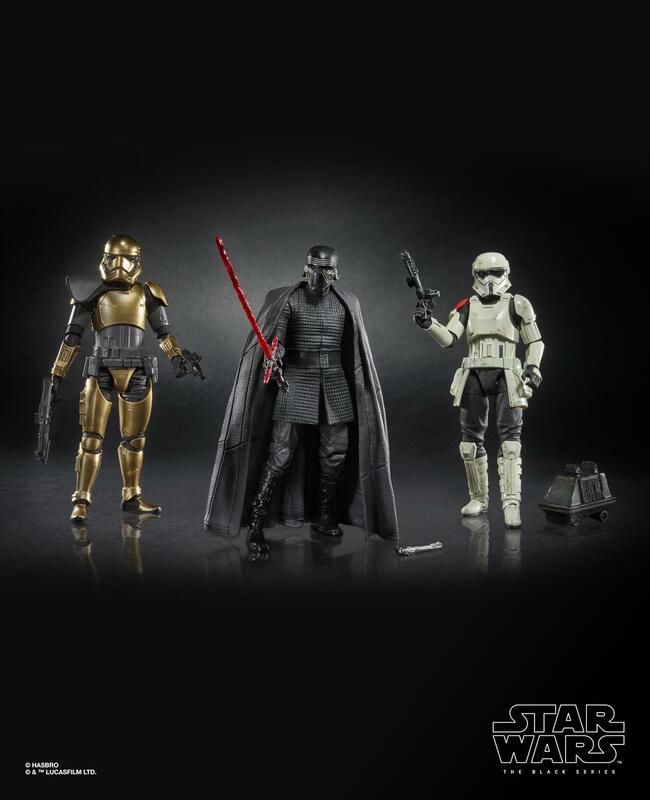 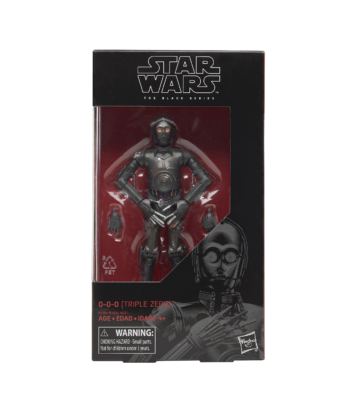 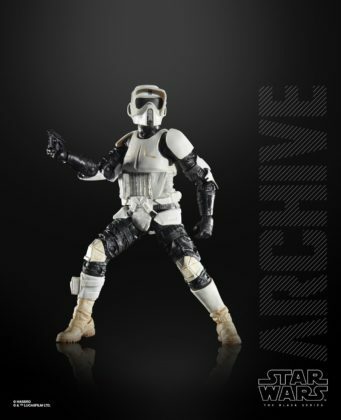 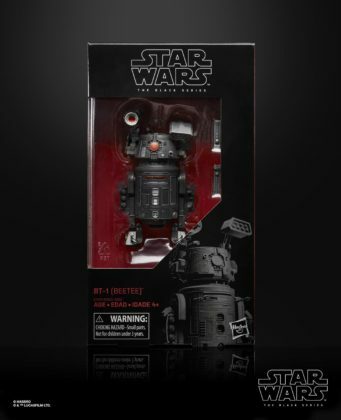 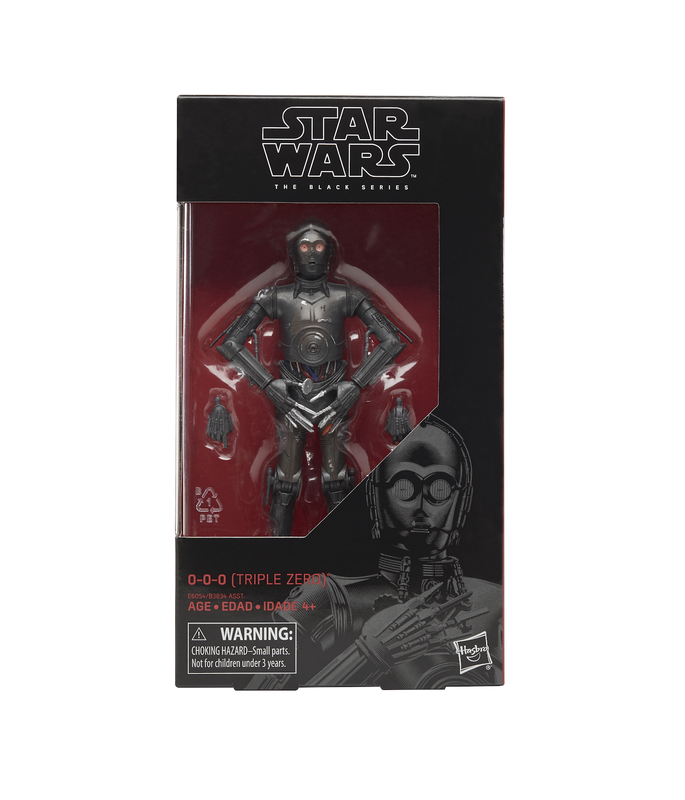 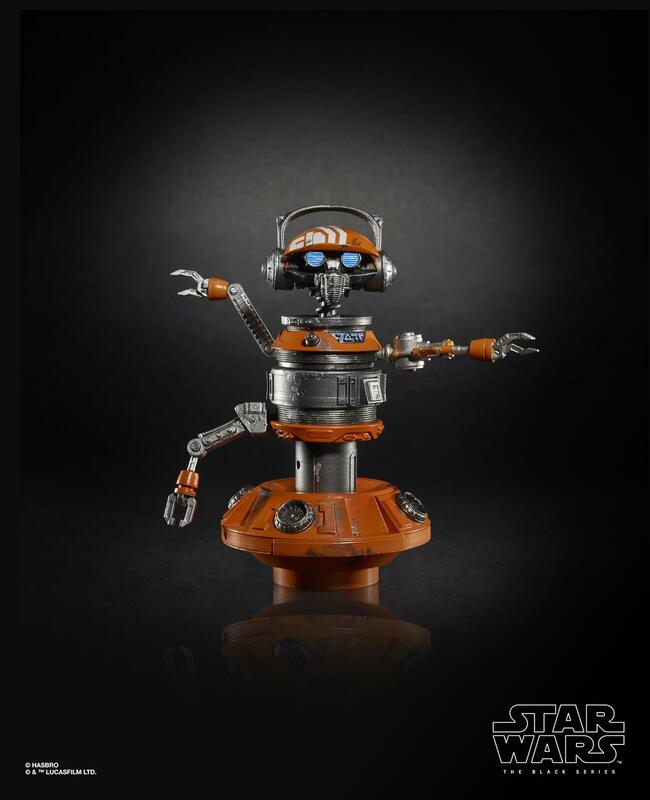 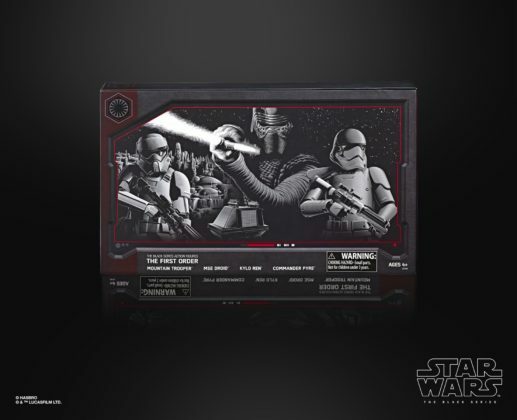 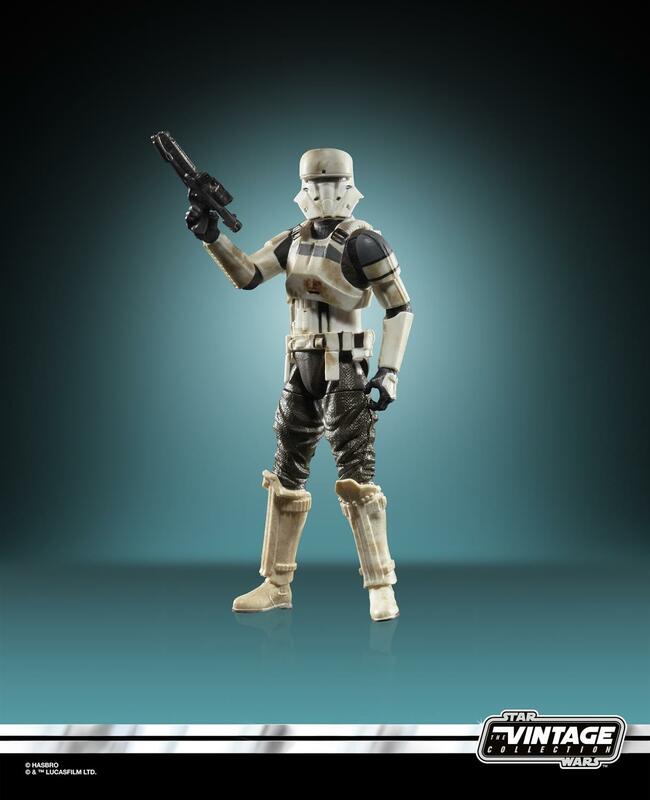 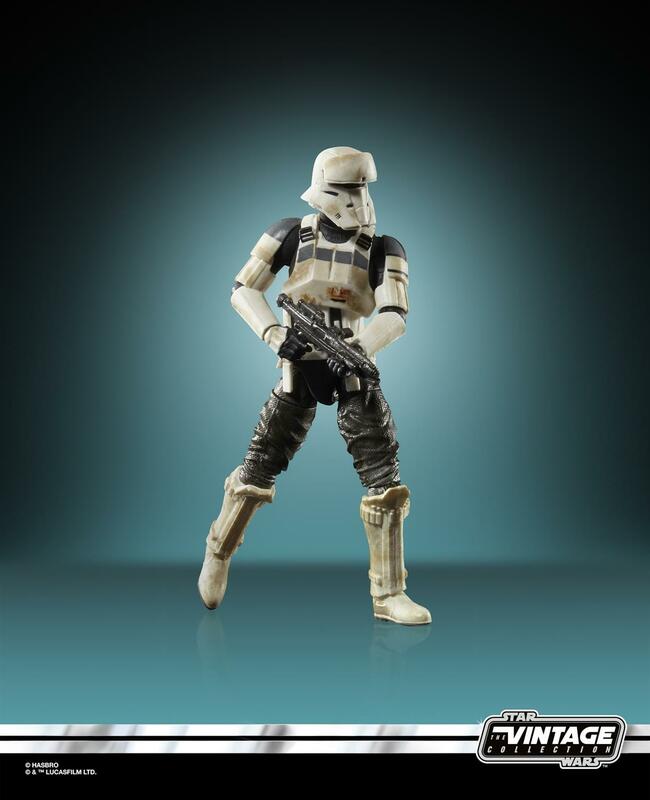 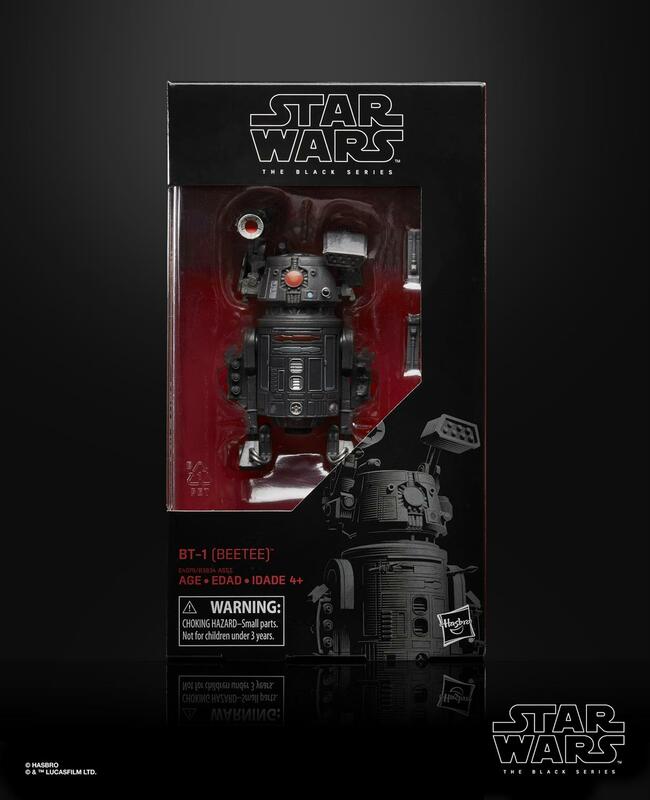 Coming to Star Wars: Galaxy’s Edge in at Disneyland Resort and Walt Disney World are several exclusive three-packs of six-inch Black Series action figures, the first of which includes Kylo Ren, Commander Pyre from Star Wars Resistance, and a specialized First Order trooper. 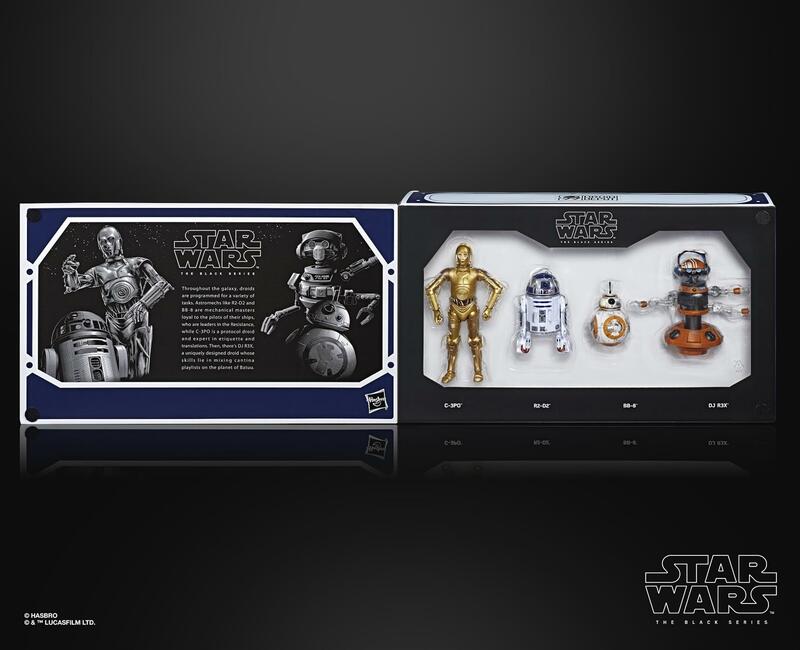 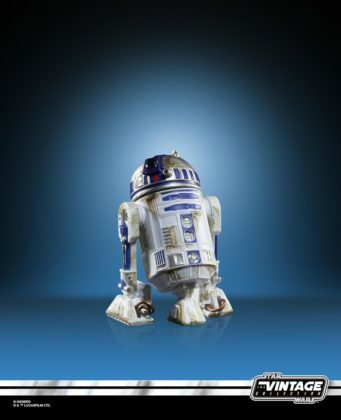 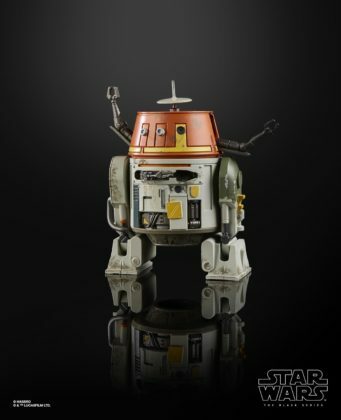 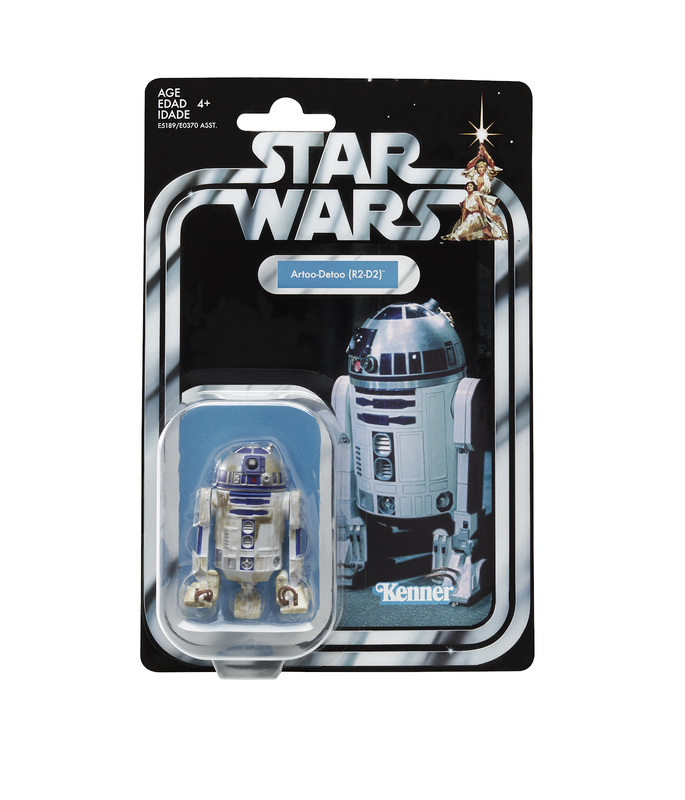 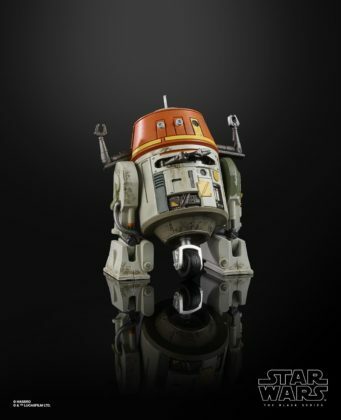 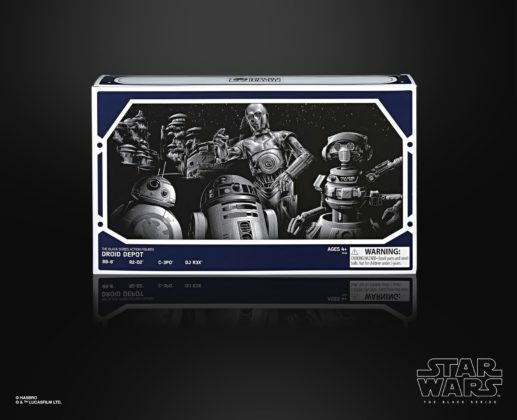 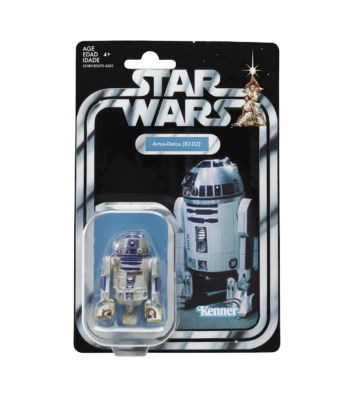 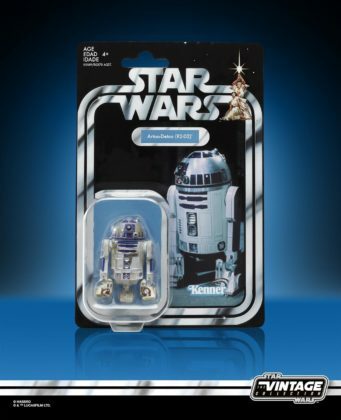 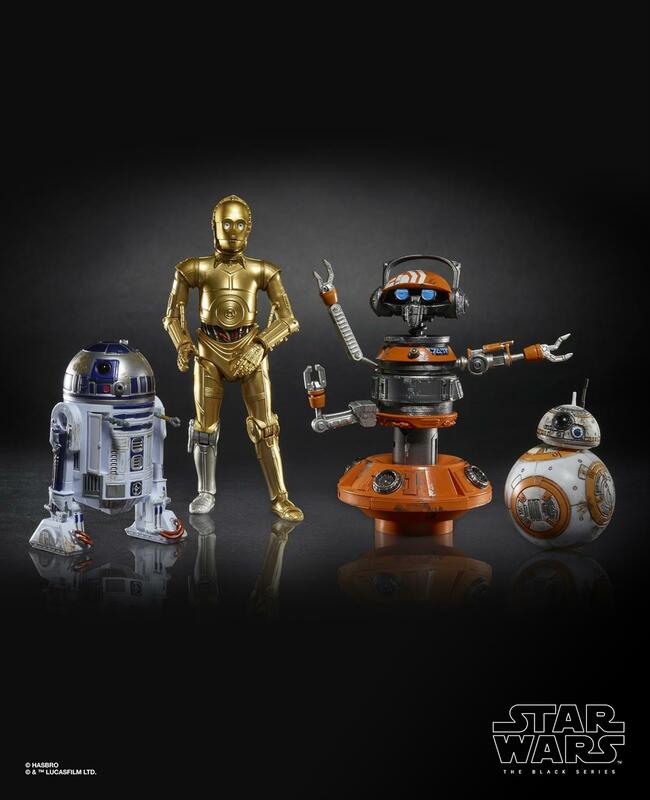 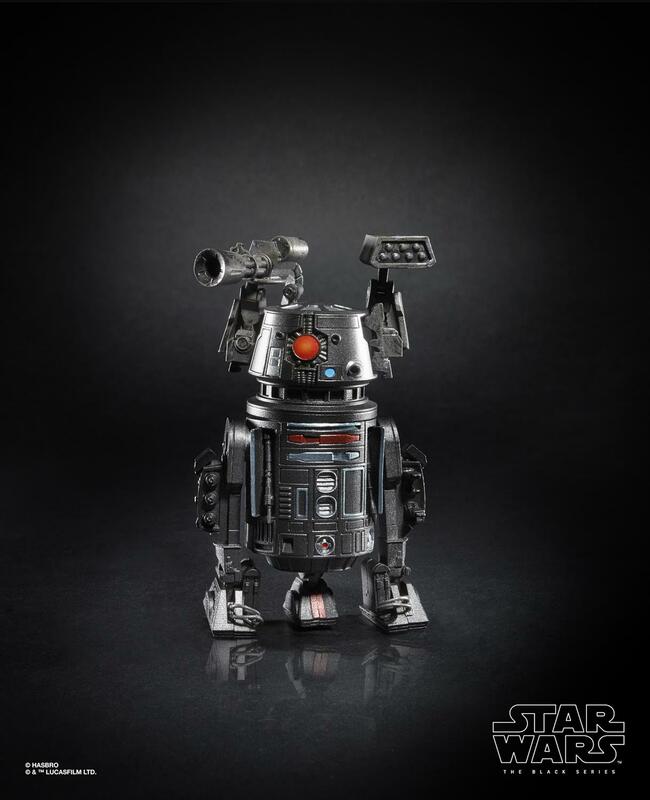 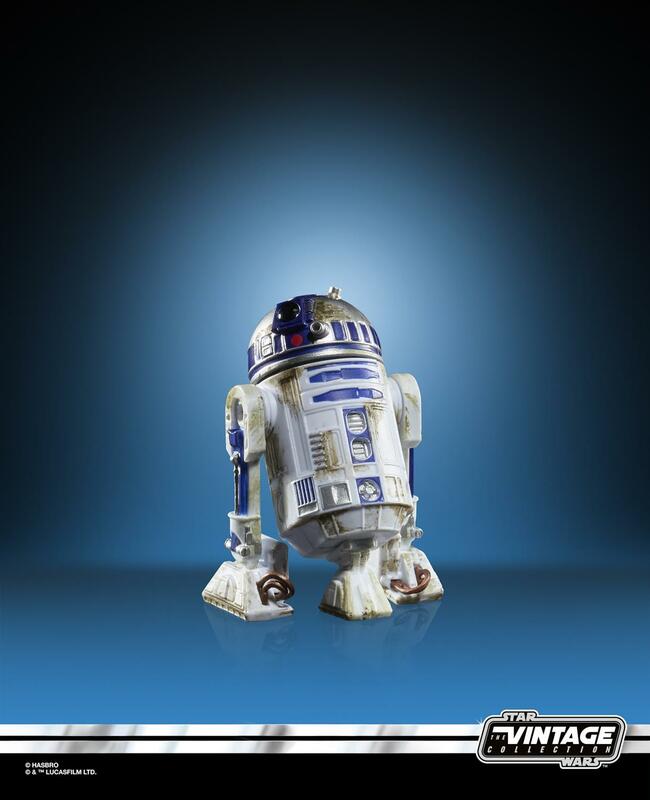 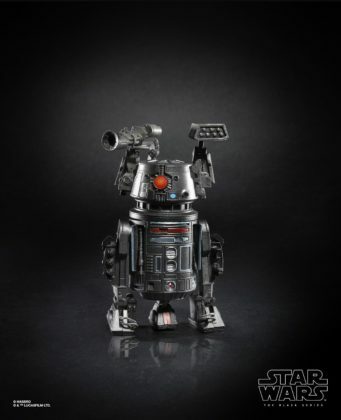 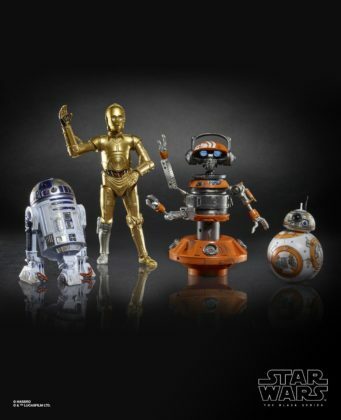 The second Galaxy’s Edge three-pack is made up of droids R2-D2, C-3PO, and (the one who will undeniably be the most sought-after) DJ Rex. 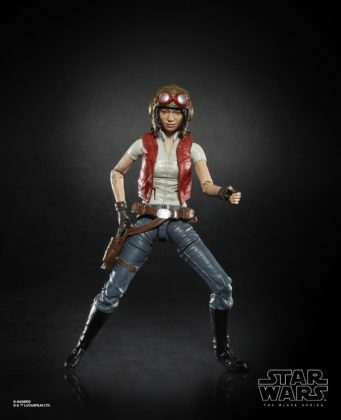 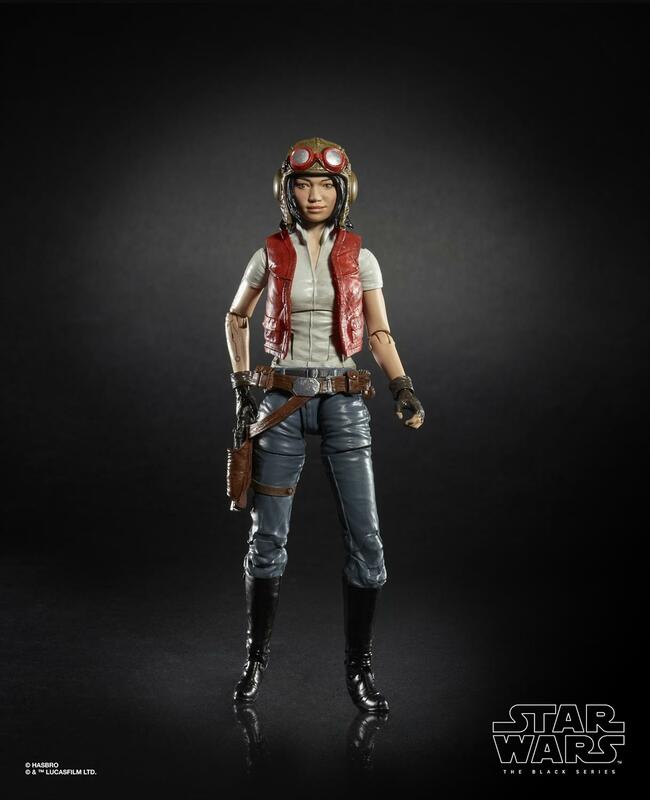 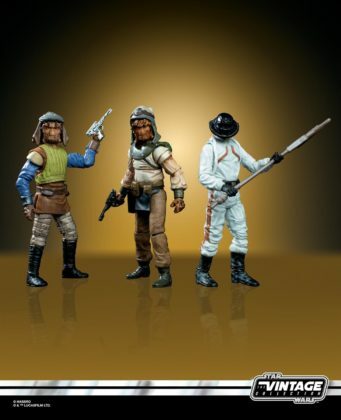 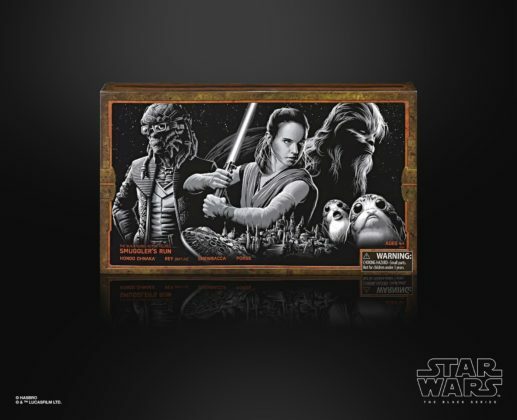 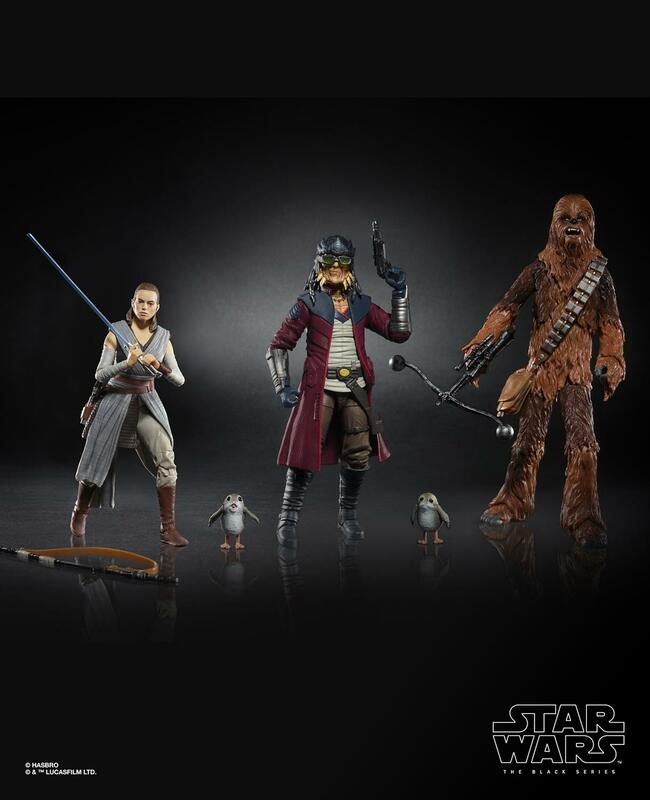 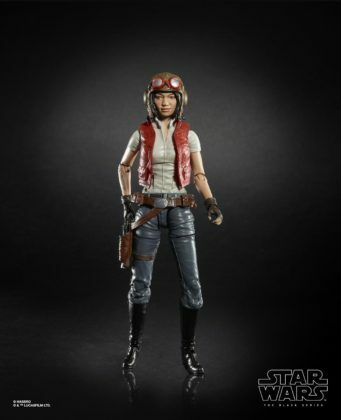 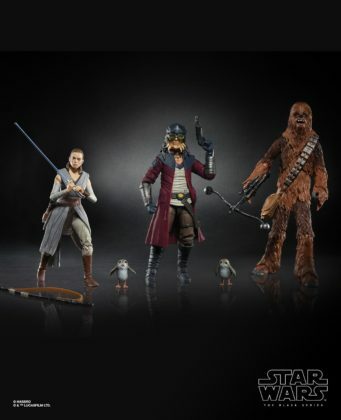 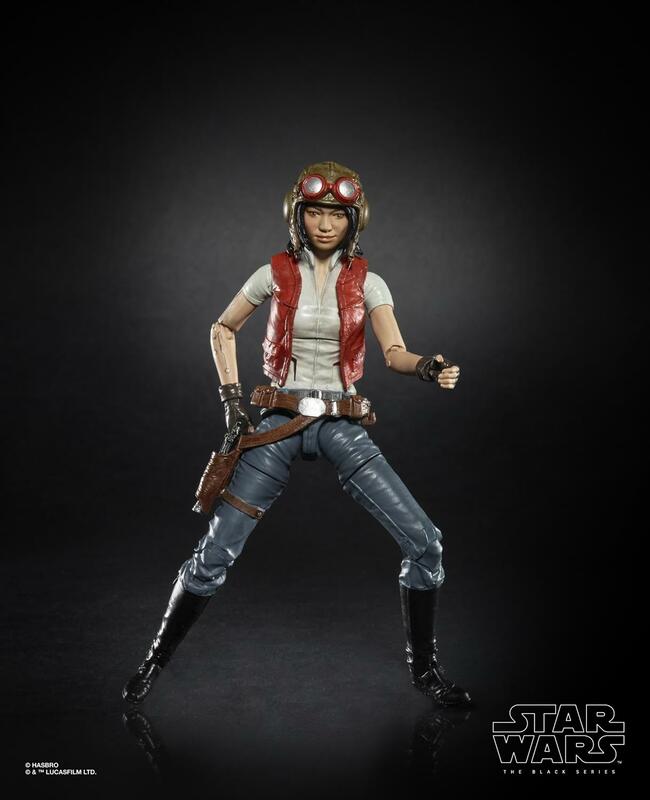 Finally from Star Wars: Galaxy’s Edge is this great-looking exclusive three-pack of Rey, Hondo, and Chewbacca. 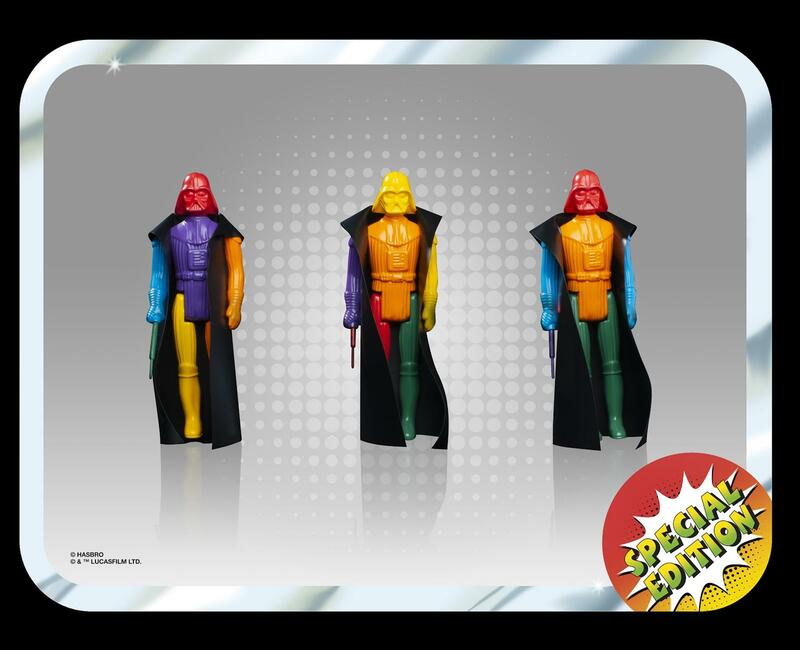 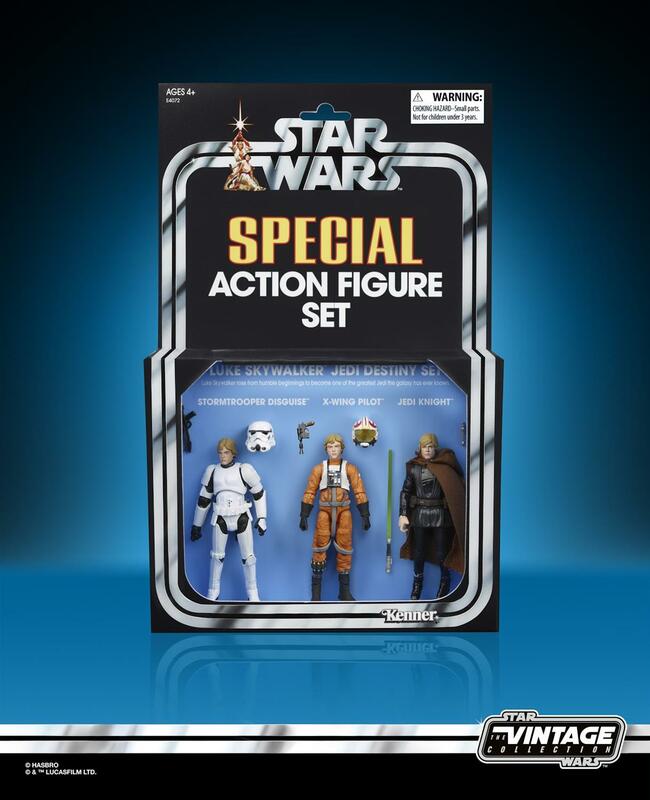 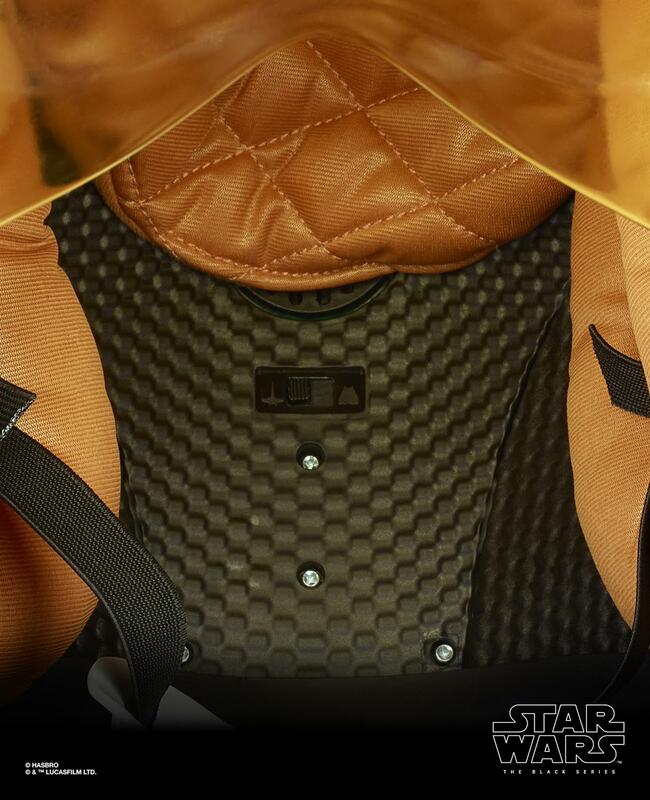 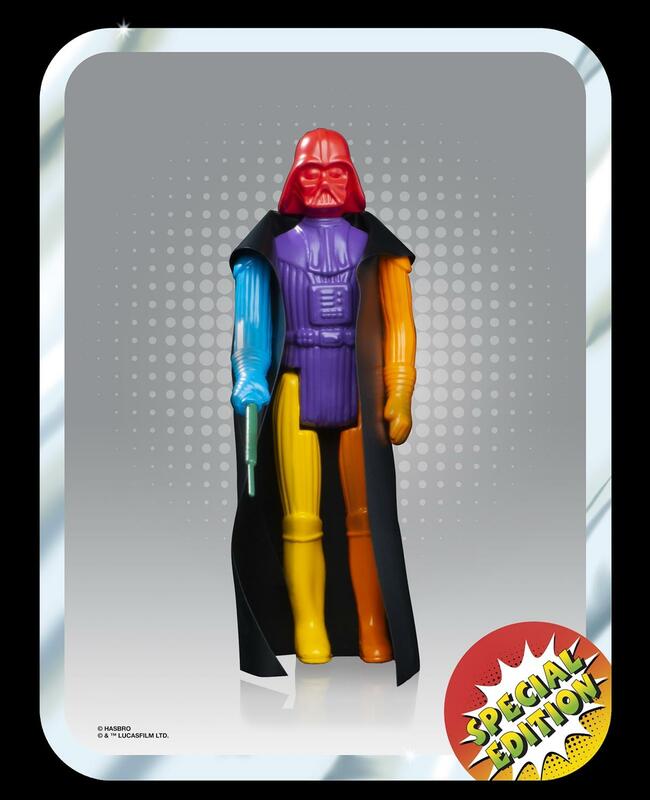 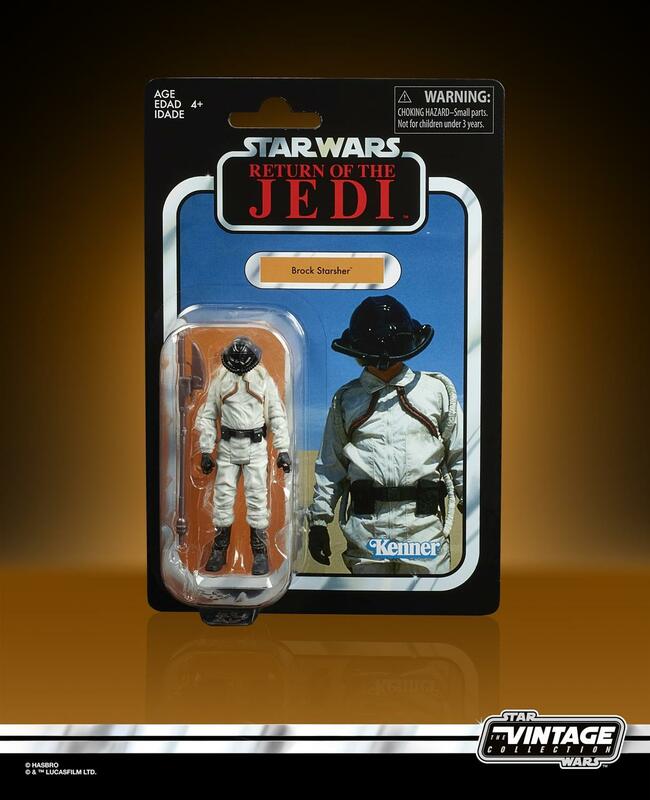 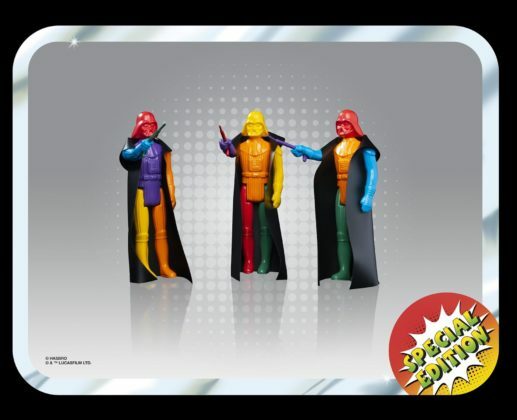 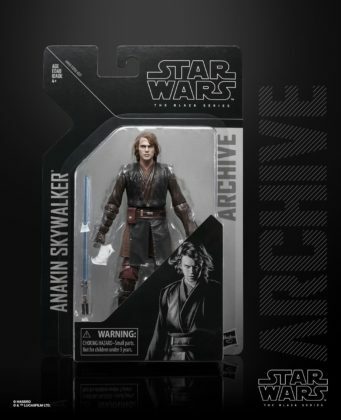 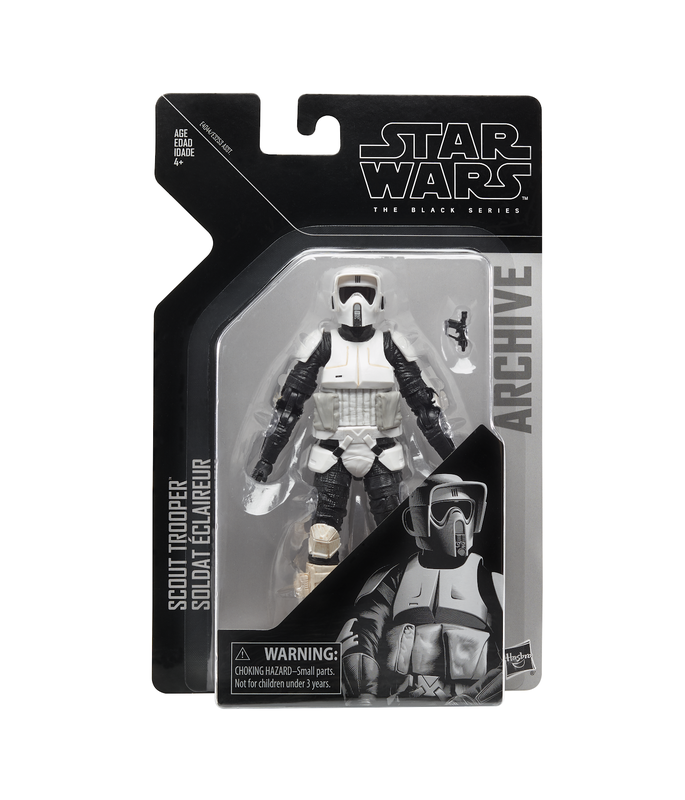 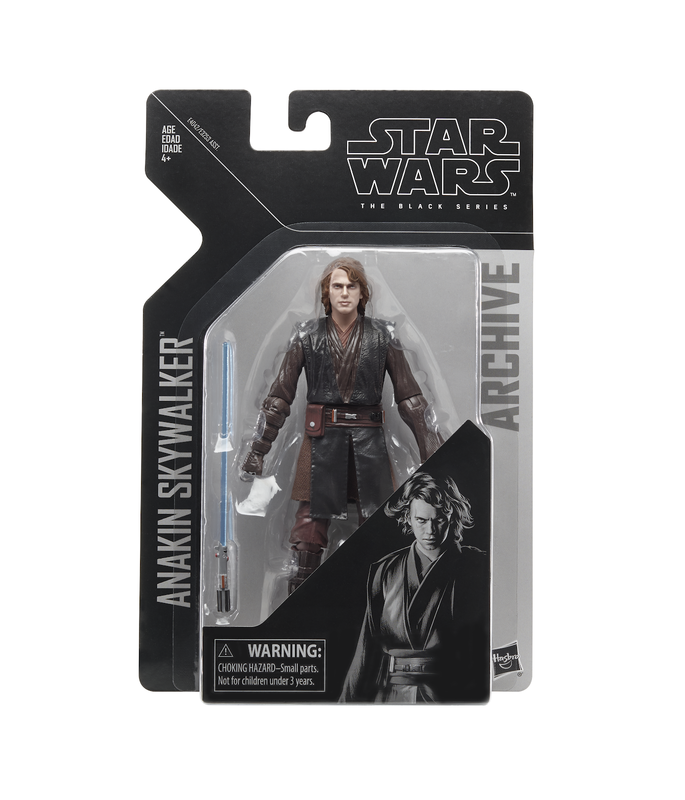 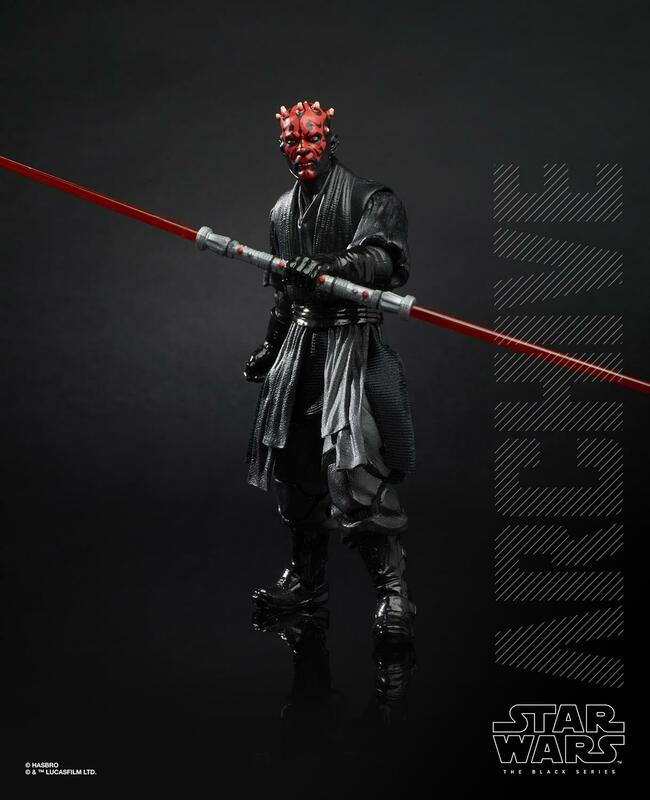 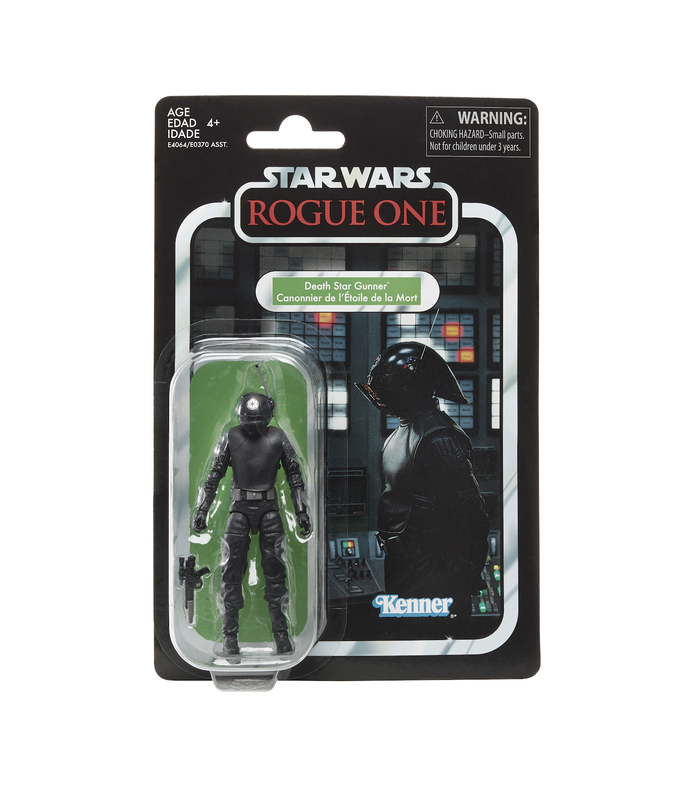 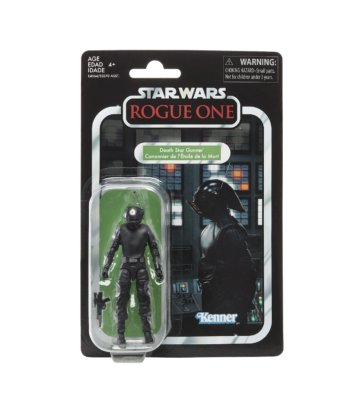 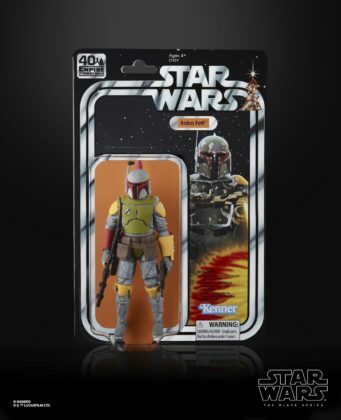 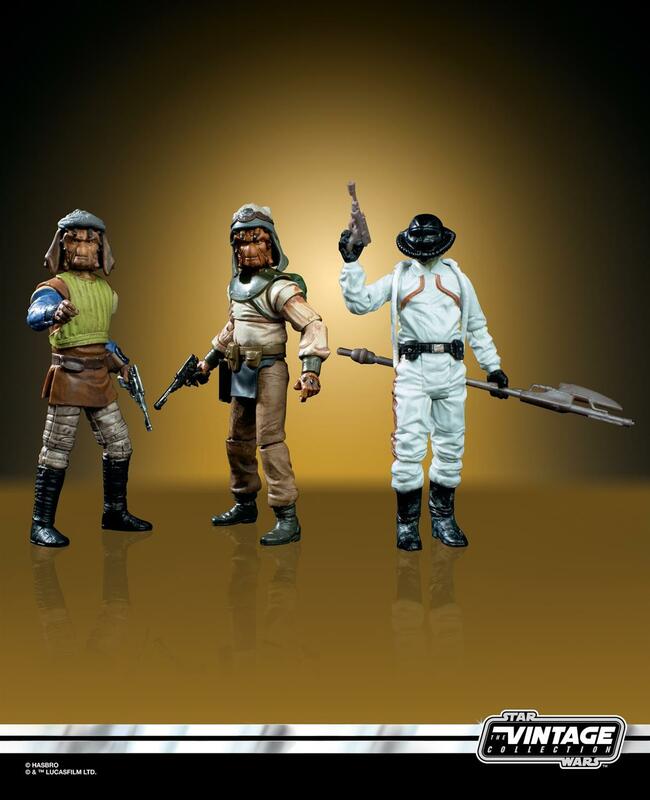 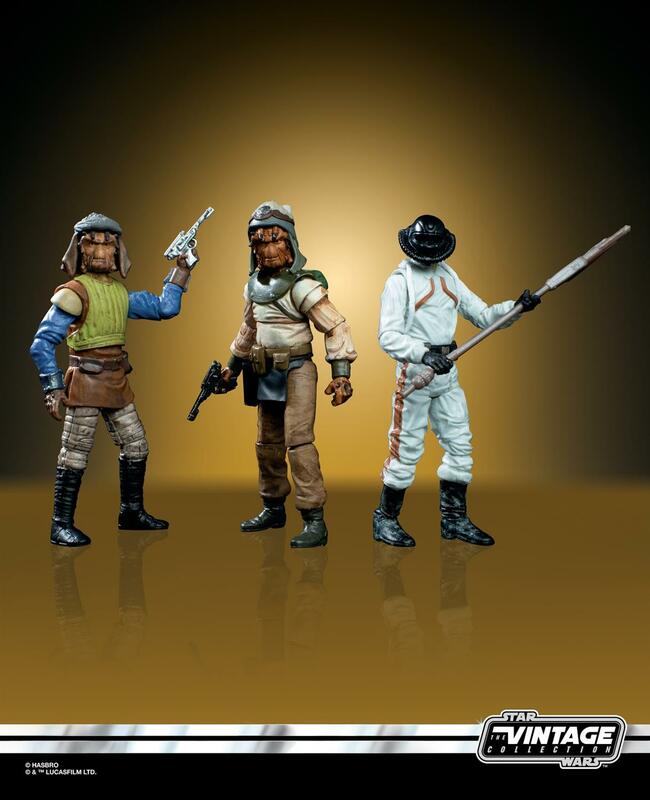 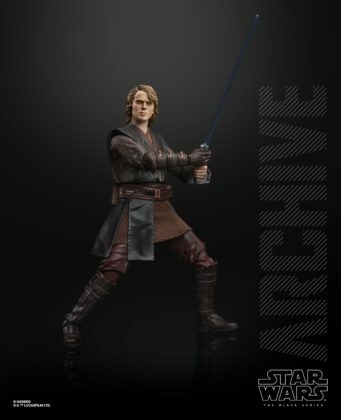 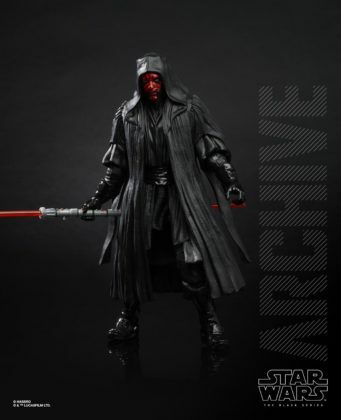 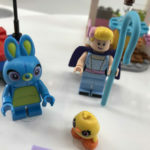 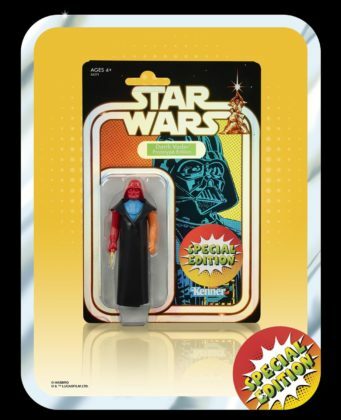 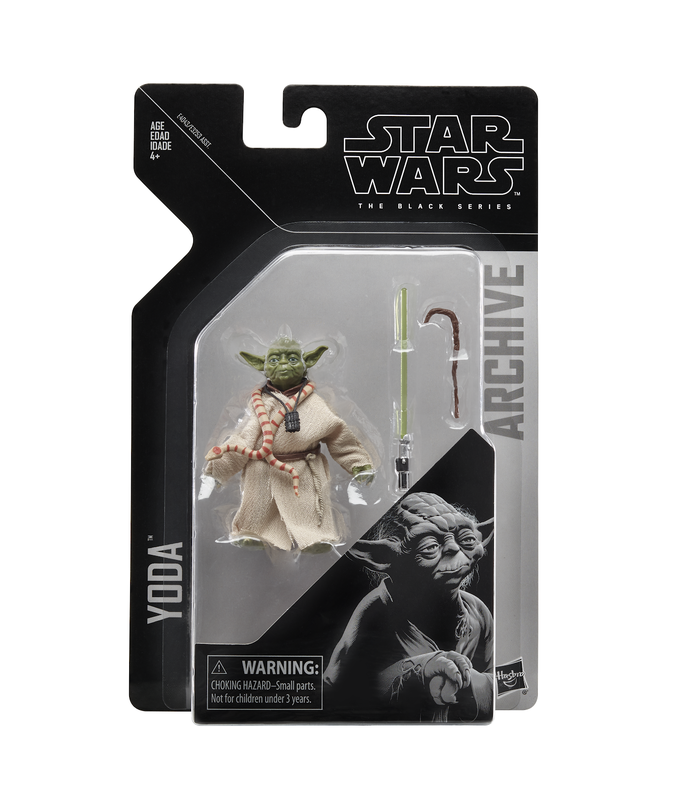 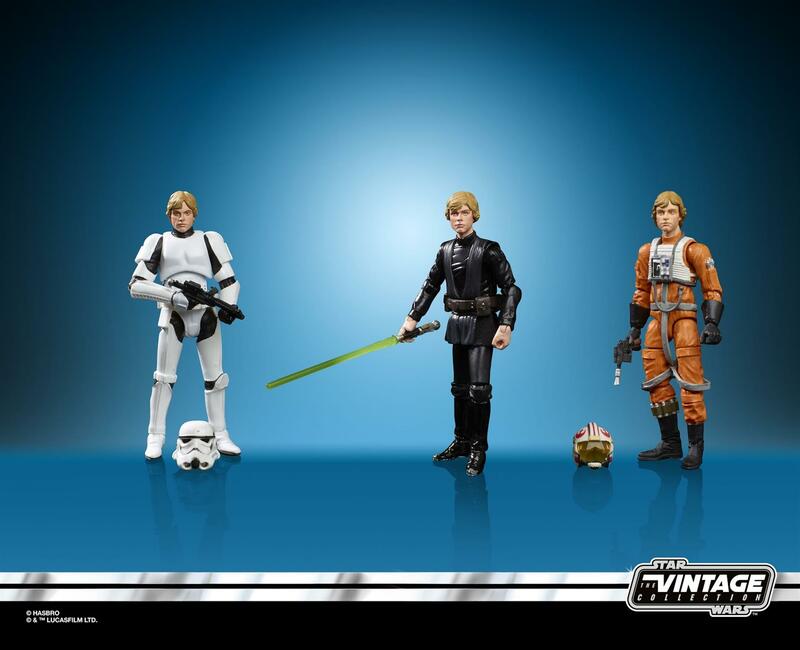 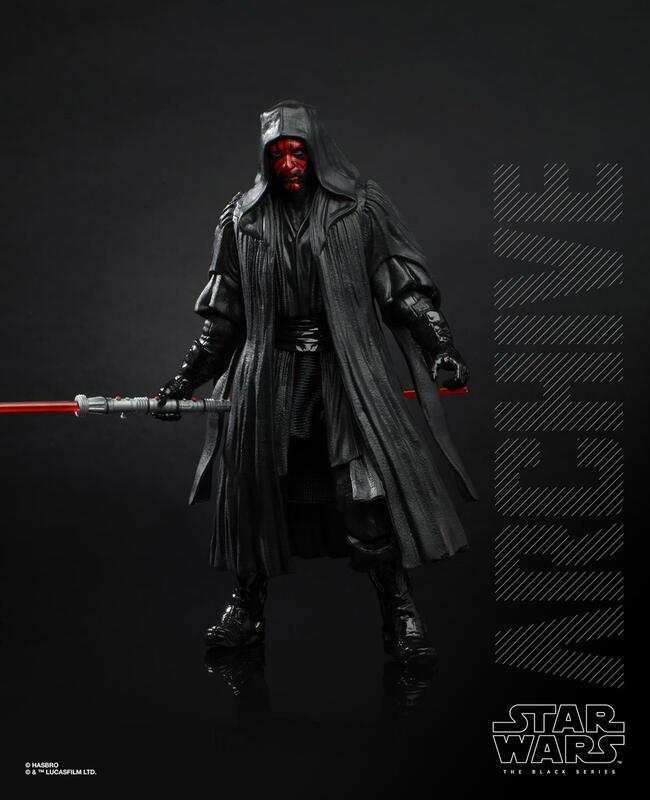 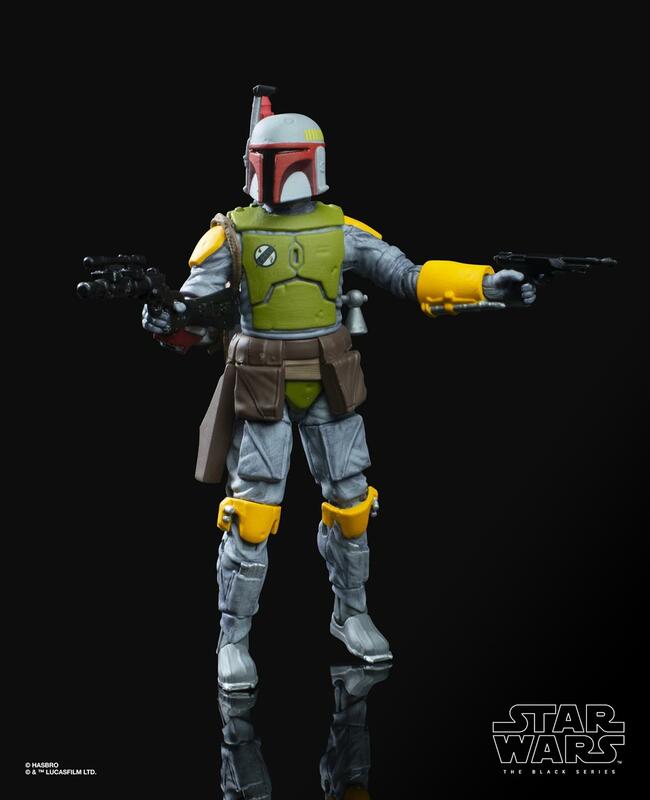 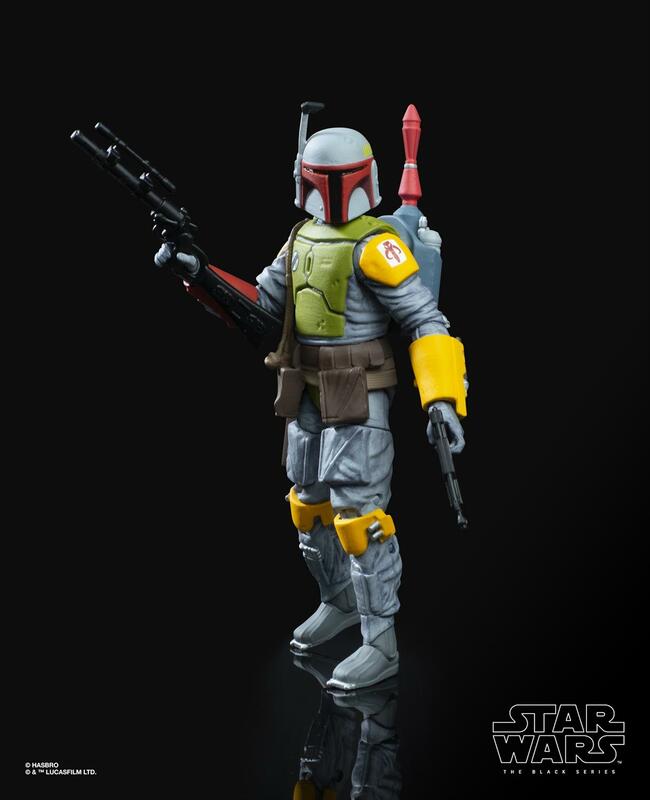 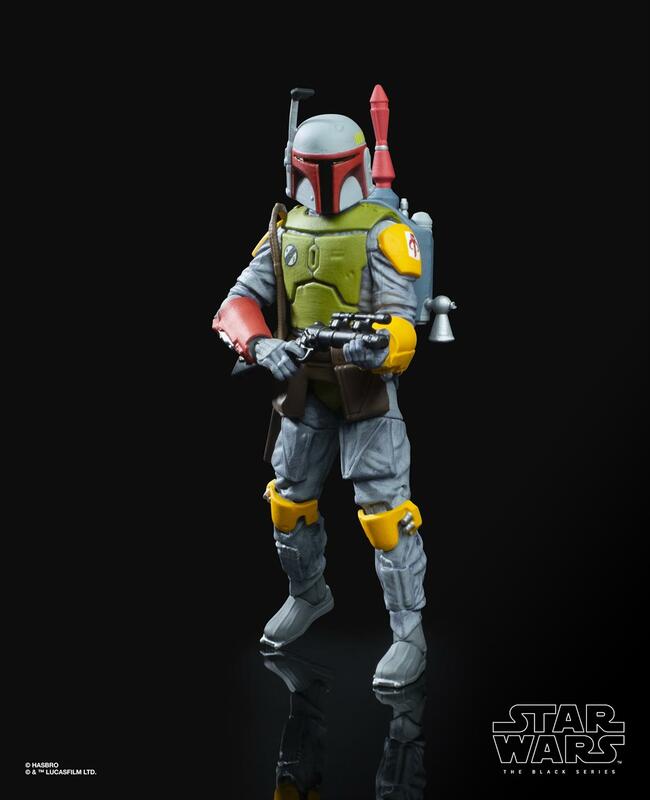 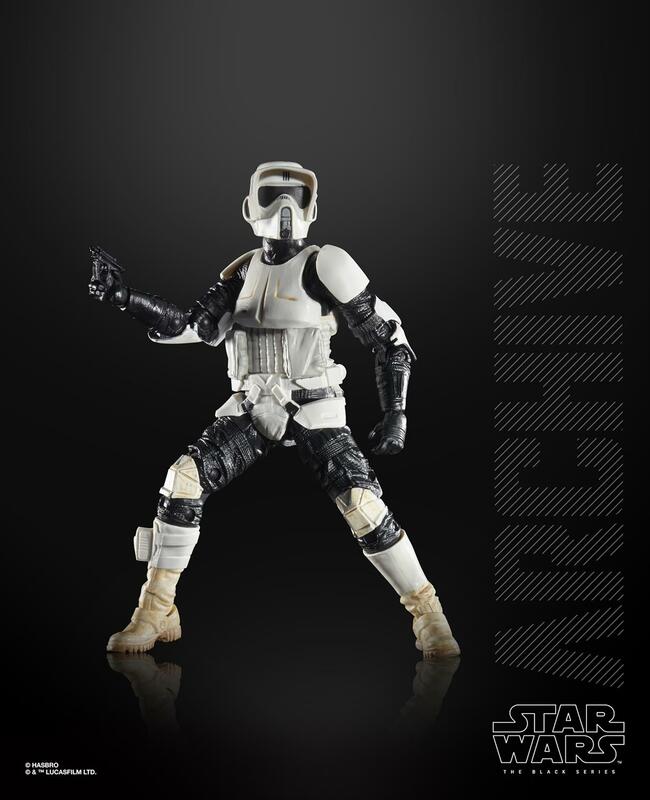 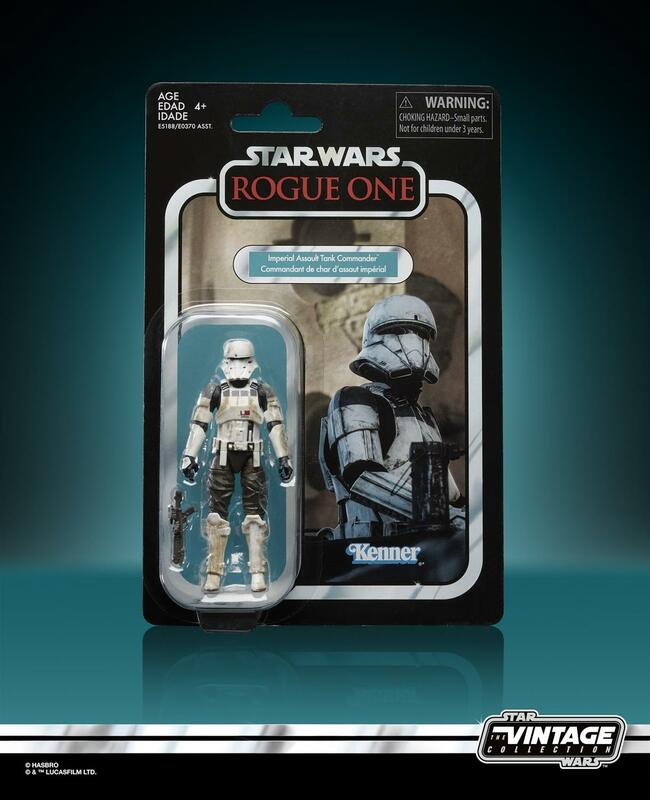 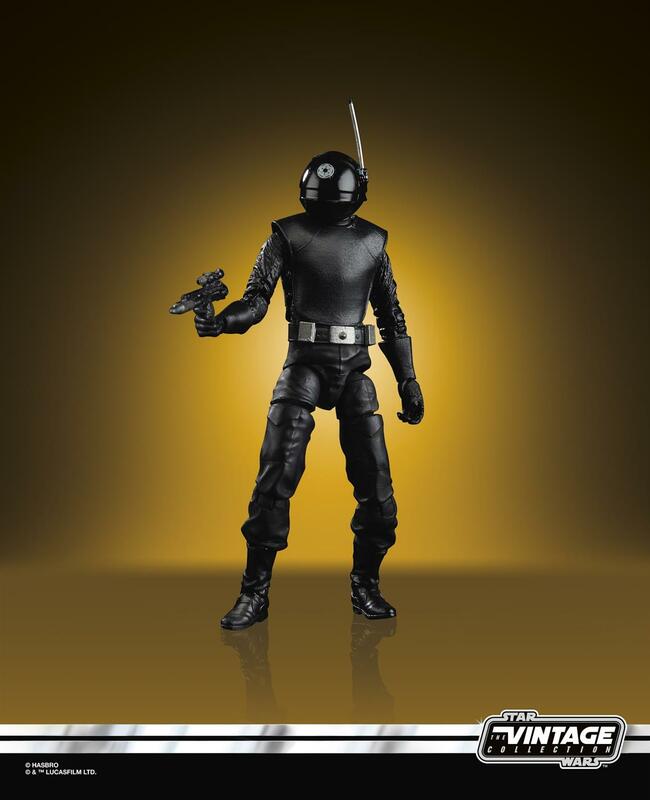 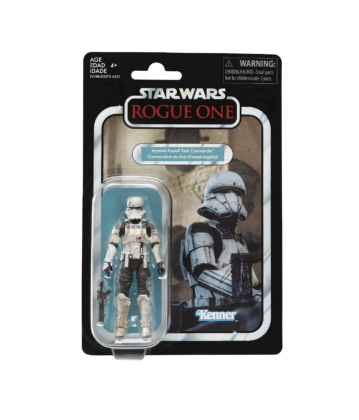 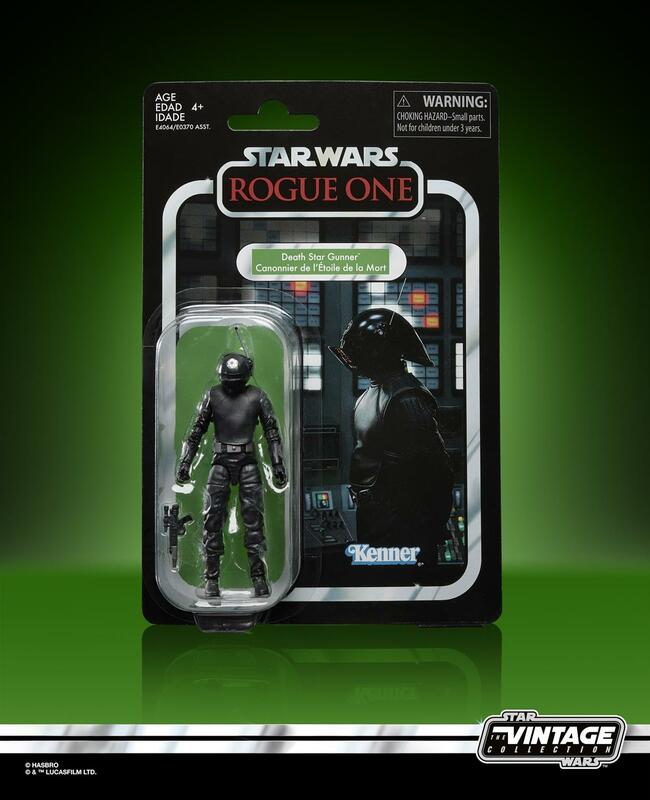 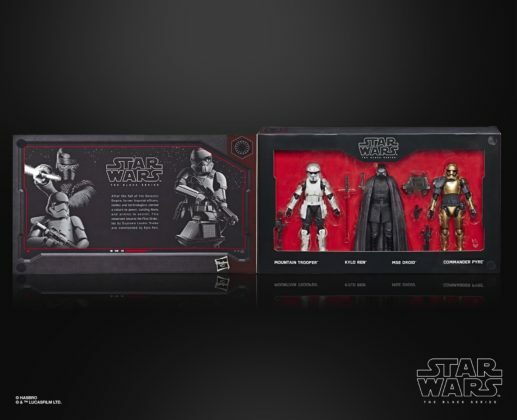 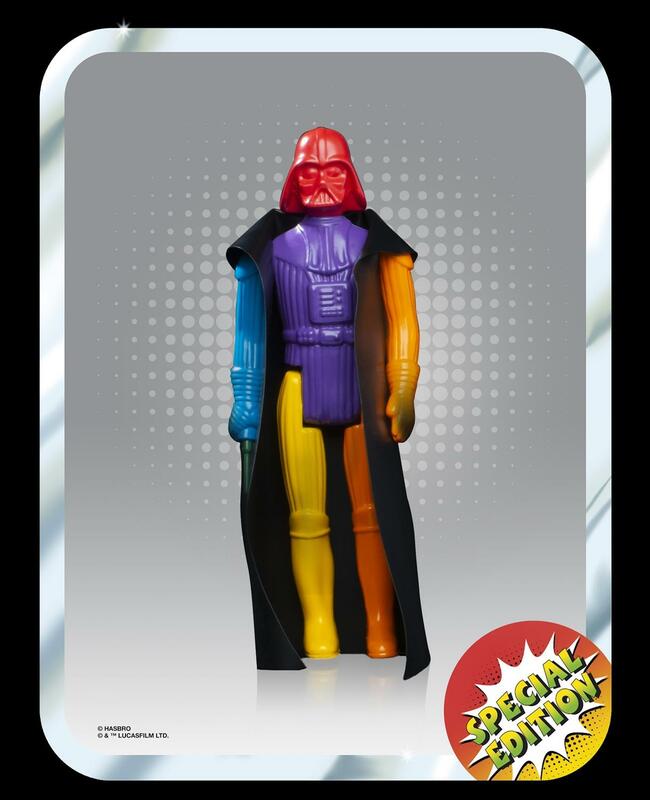 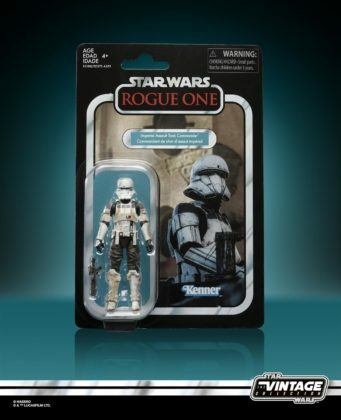 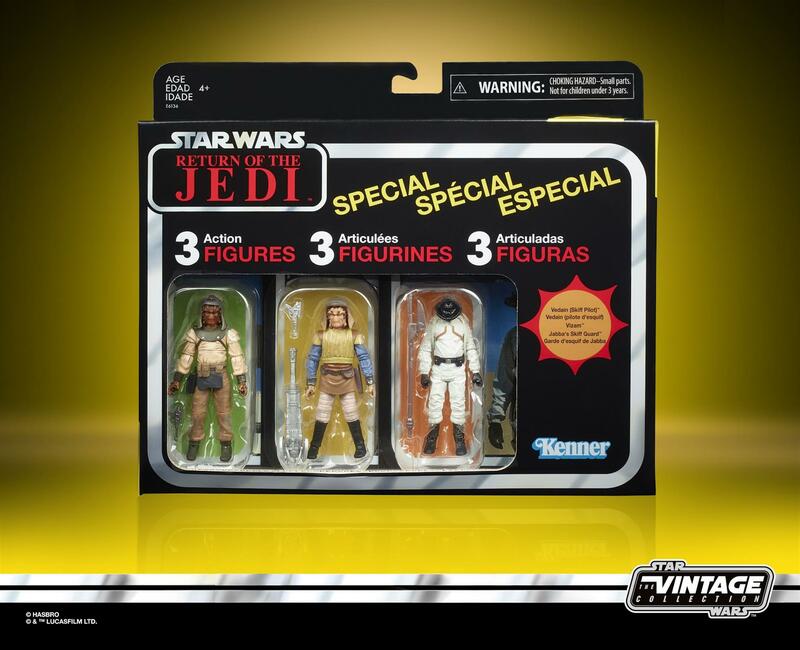 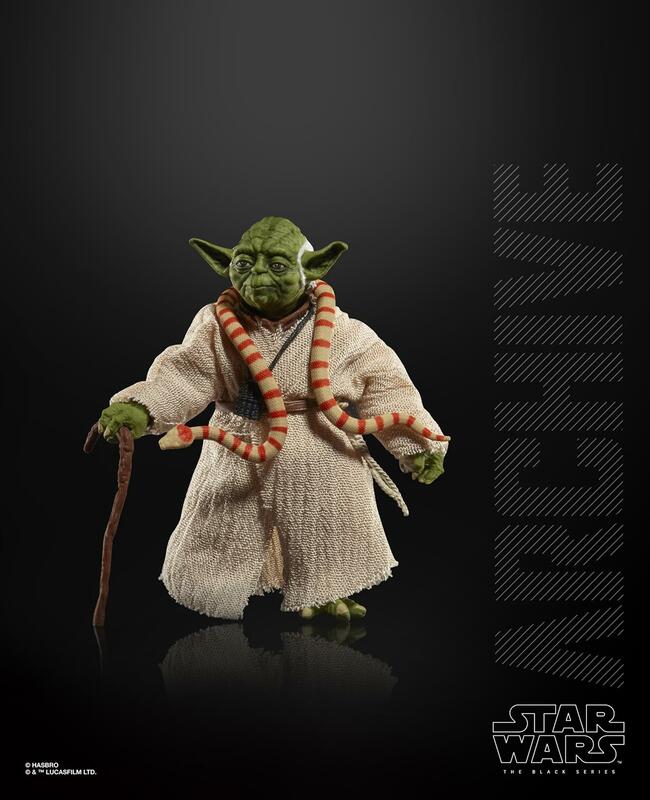 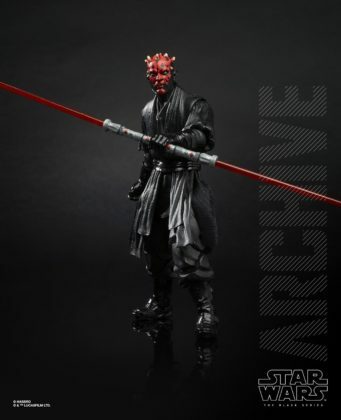 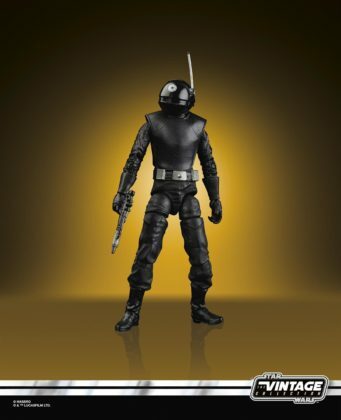 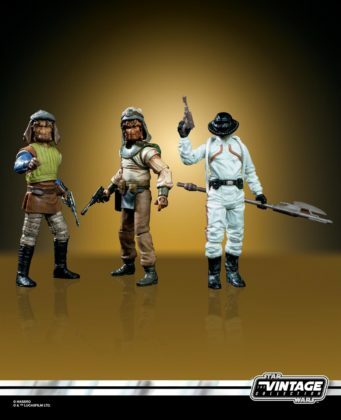 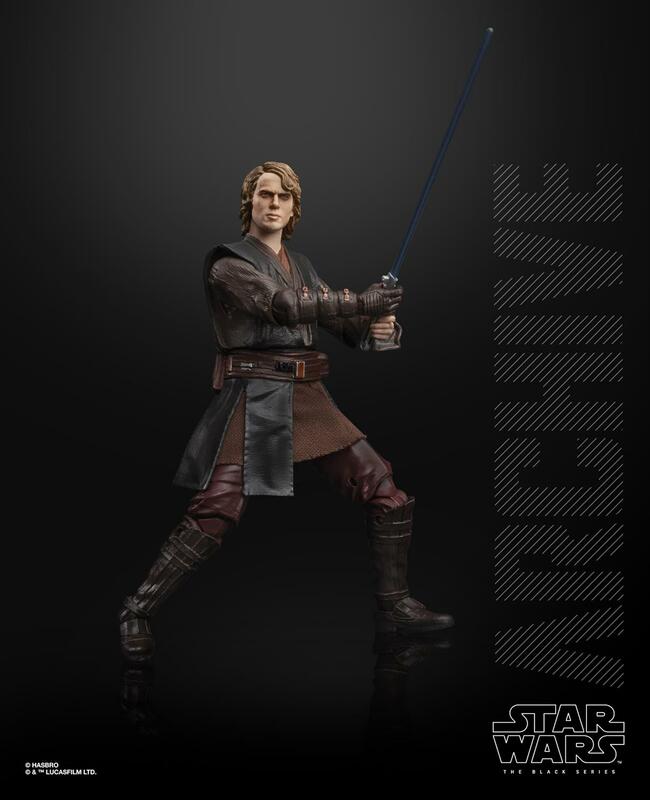 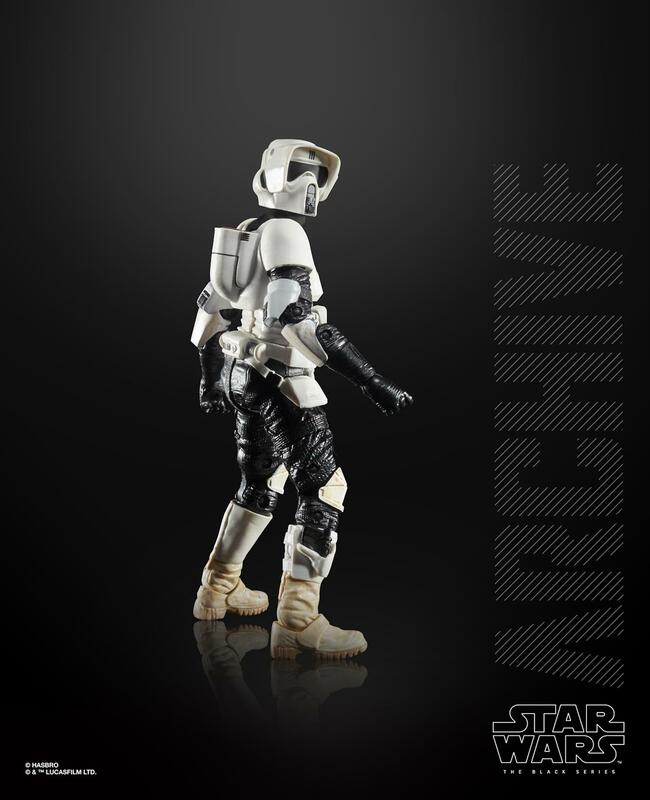 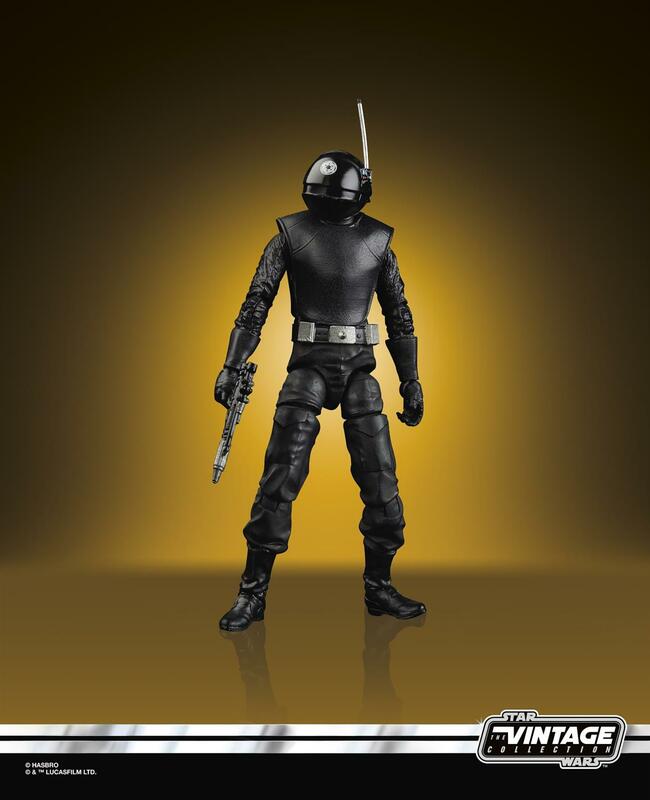 Three San Diego Comic-Con 2019 convention exclusives were revealed during the Star Wars Celebration Hasbro panel: a Darth Vader Prototype Special Edition with odd neon coloring representing the early stages of action figure design, an awesome Boba Fett 40th Anniversary six-inch Black Series figure recalling the character’s first-ever toy appearance, and a 3 ¾-inch Luke Skywalker three-pack representing the Original Trilogy. 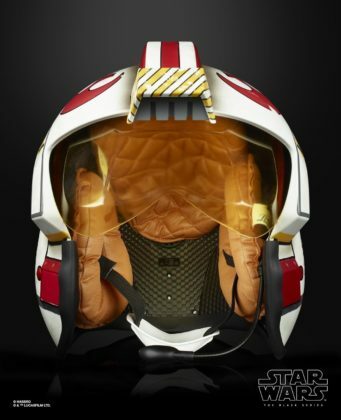 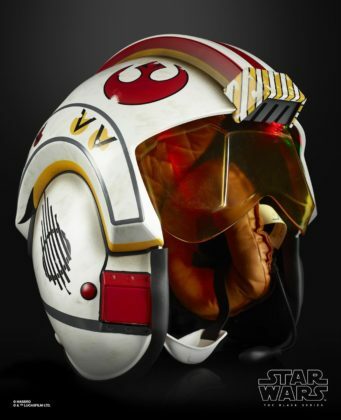 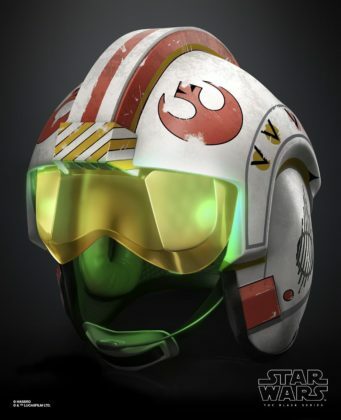 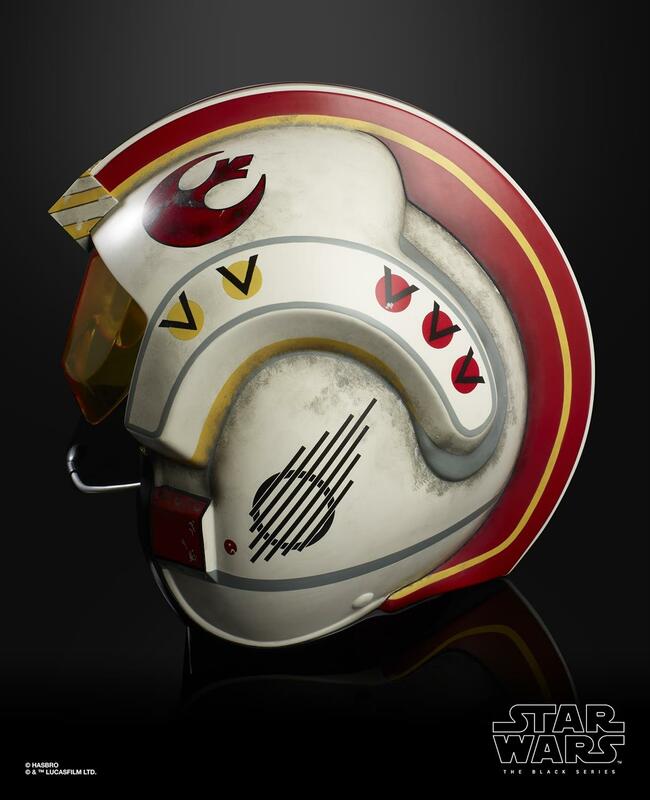 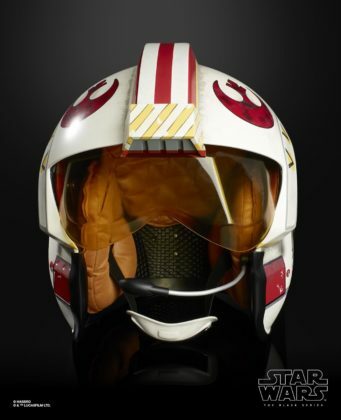 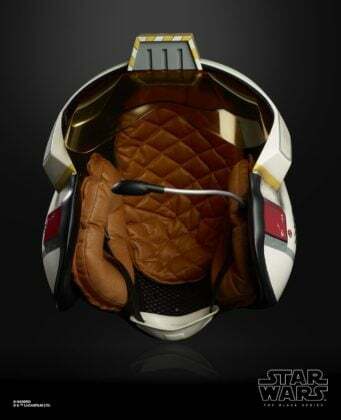 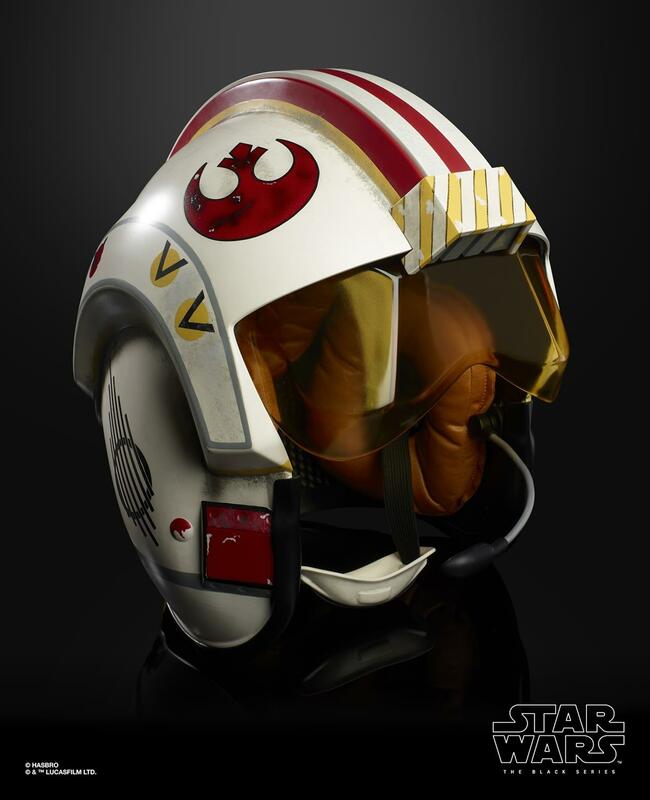 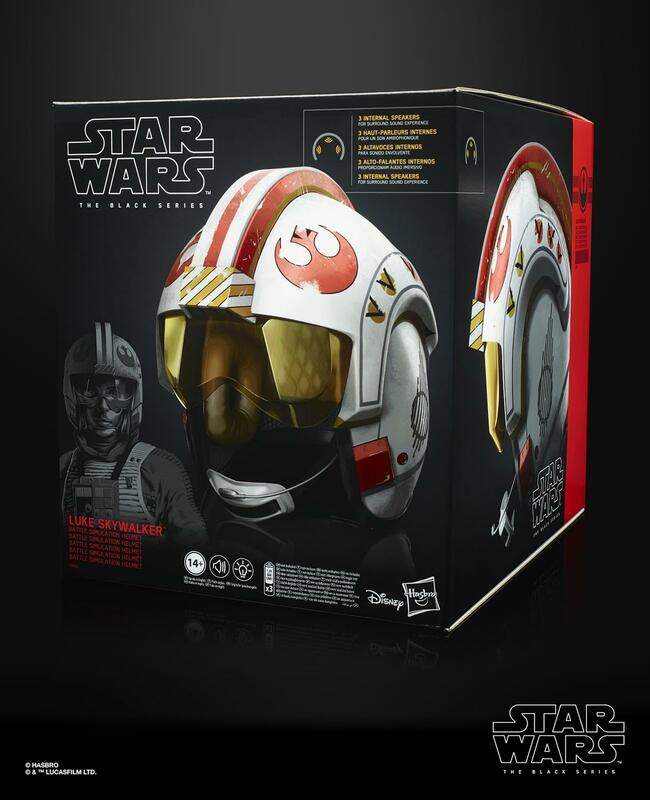 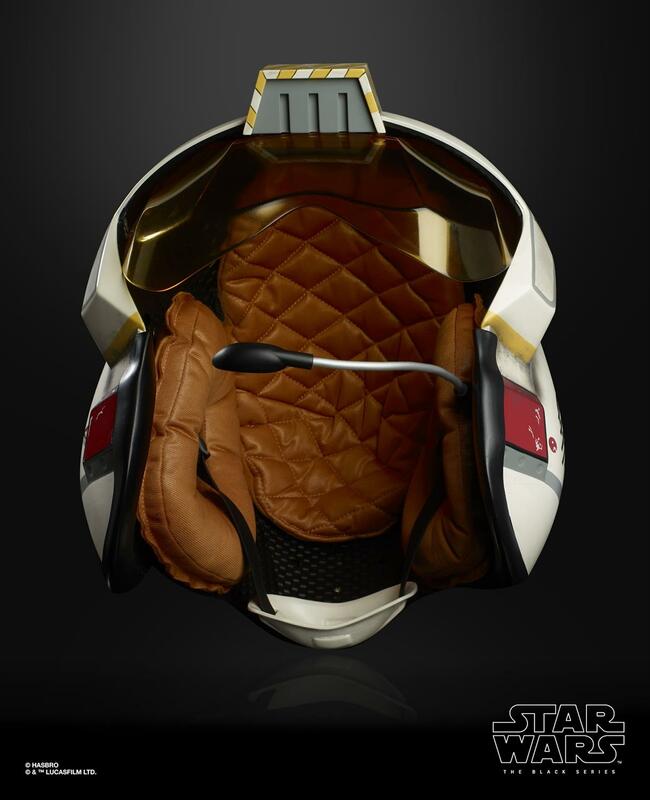 Finally, the Hasbro team revealed a very authentic-looking Luke Skywalker Rebel Pilot Black Series helmet complete with surround-sound audio effects. 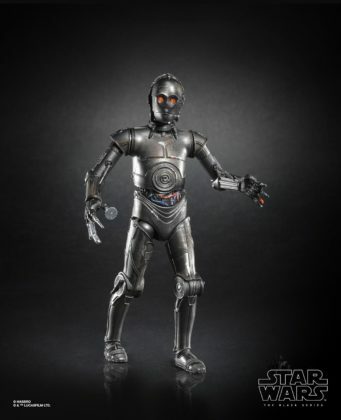 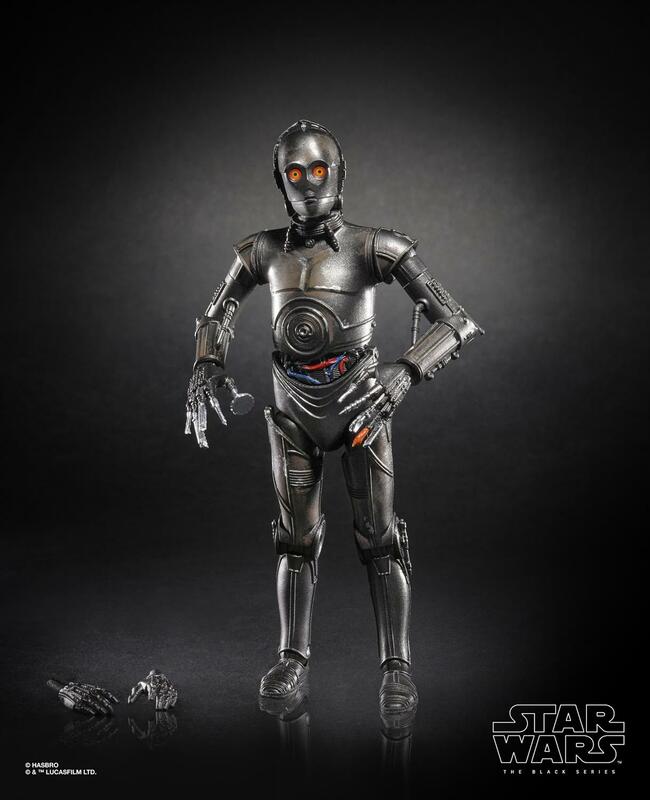 As soon as the Hasbro panel was over, the Star Wars: Galaxy’s Edge exclusive Black Series figures were made available for viewing in a display on the exhibit hall floor. 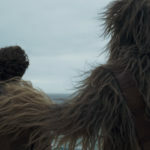 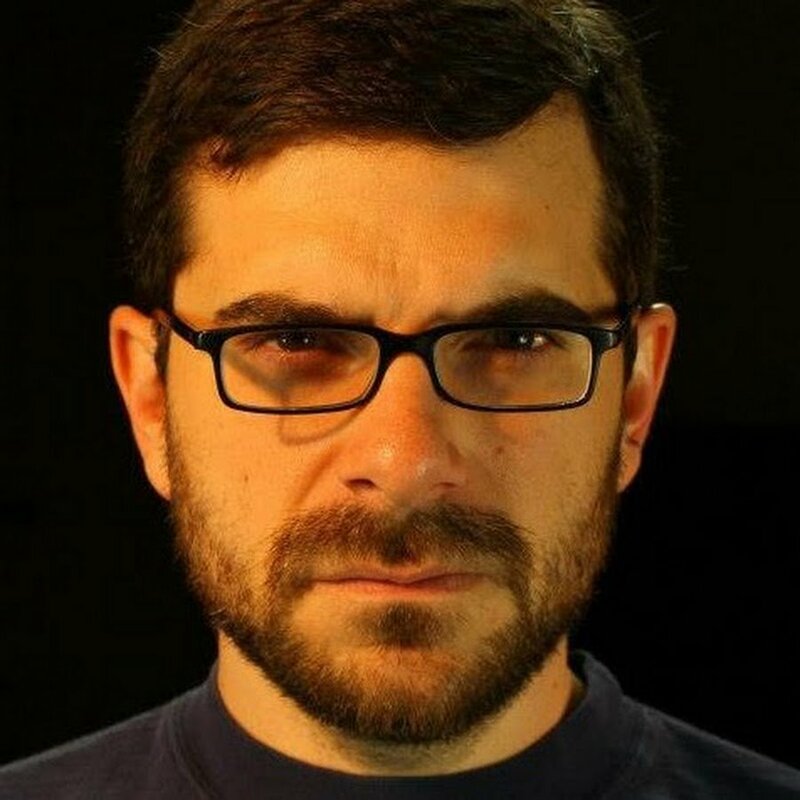 For much more from Star Wars Celebration 2019 in Chicago, continue checking back here at LaughingPlace.com, and watch for additional coverage on our Twitter feed and YouTube channel. May the Force Be with You!